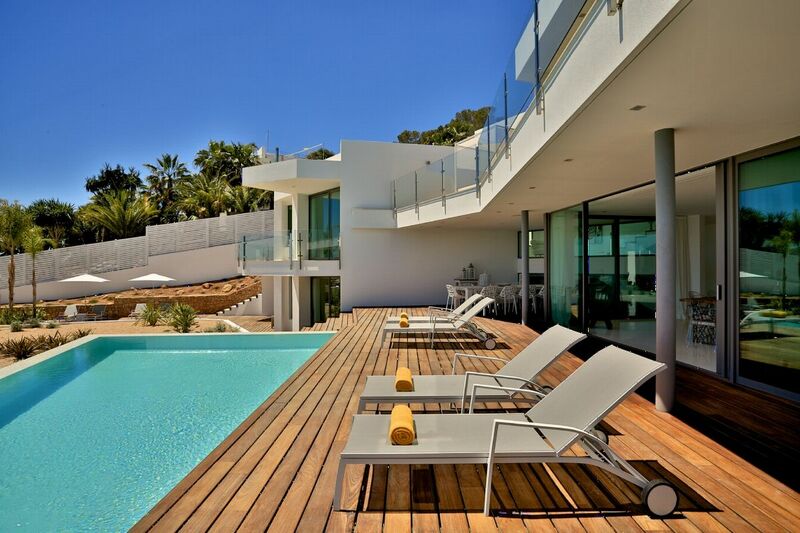 Cleaning 6 days per week for 3 hours. 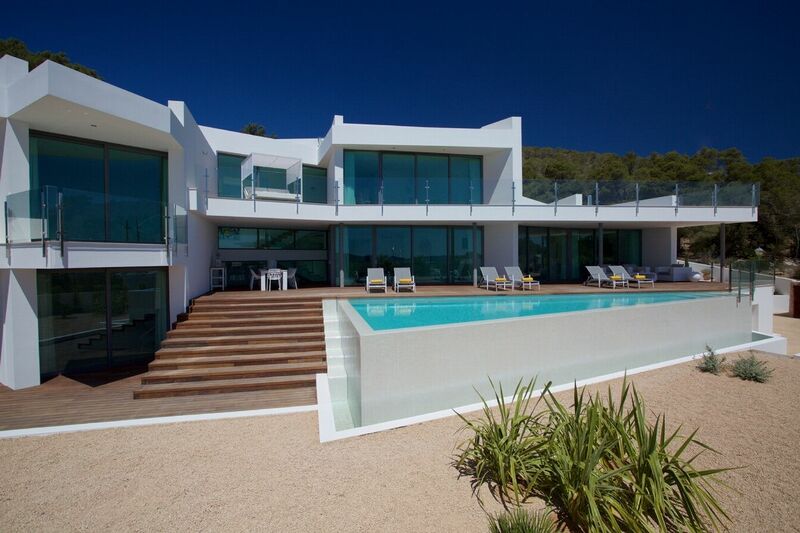 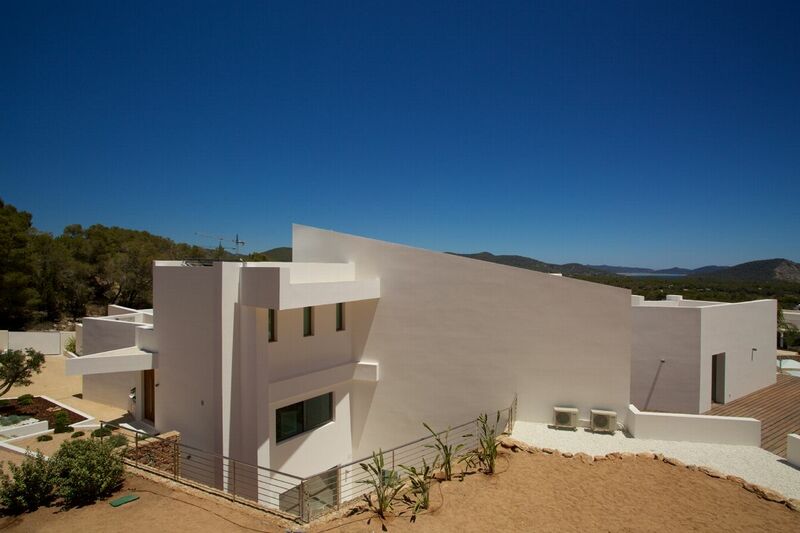 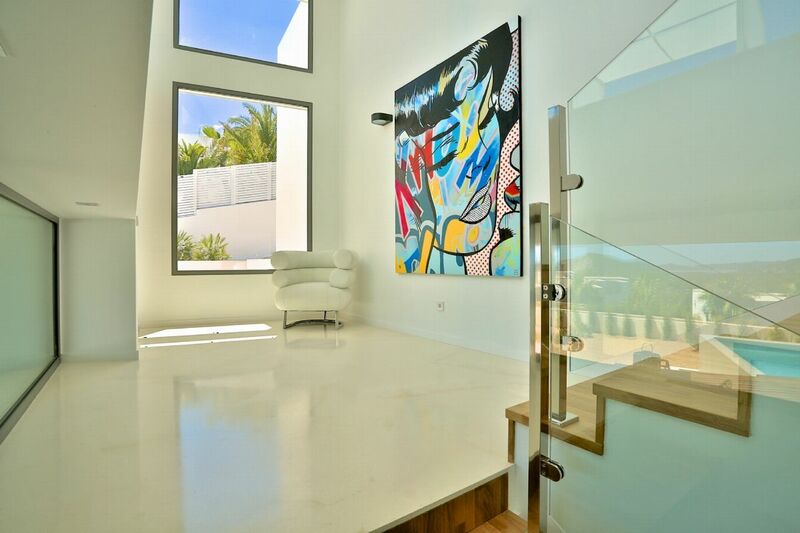 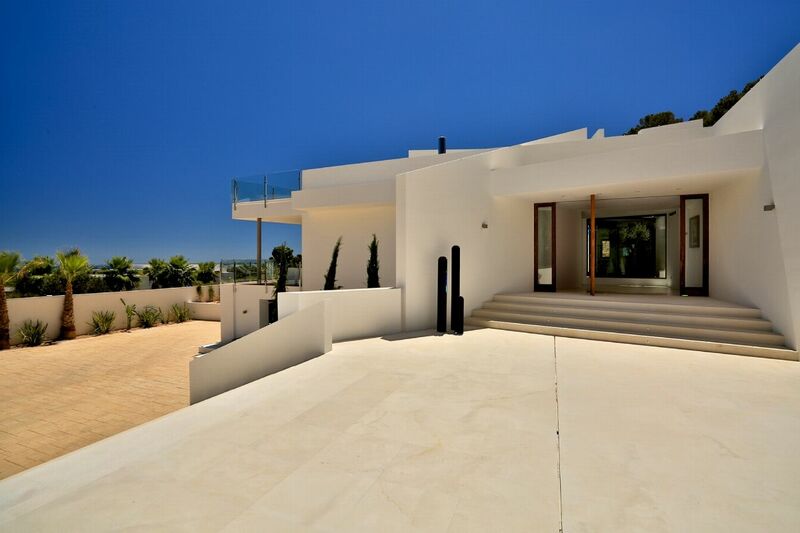 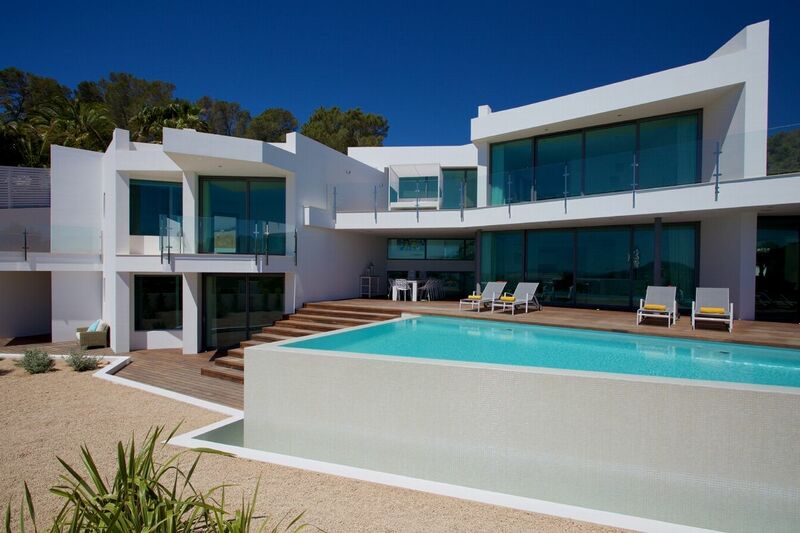 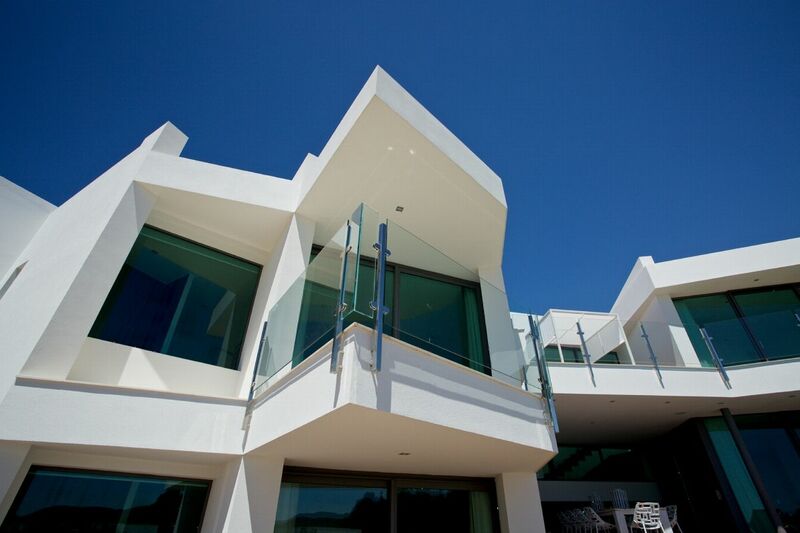 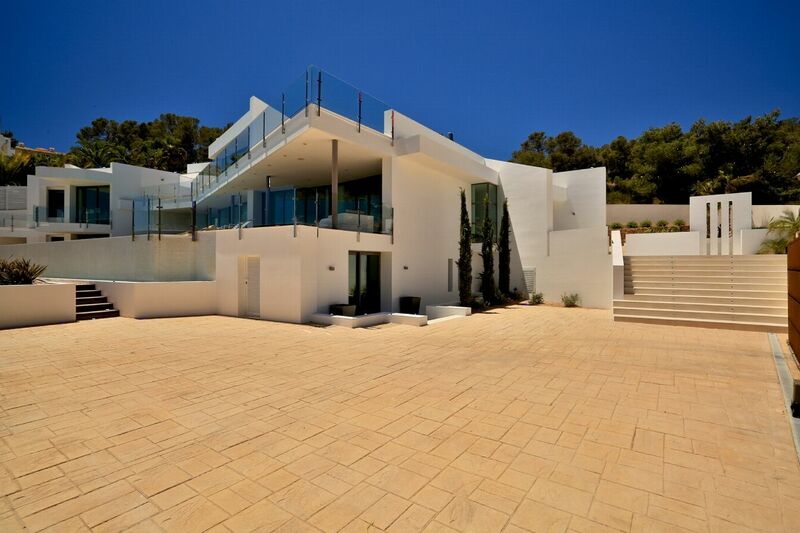 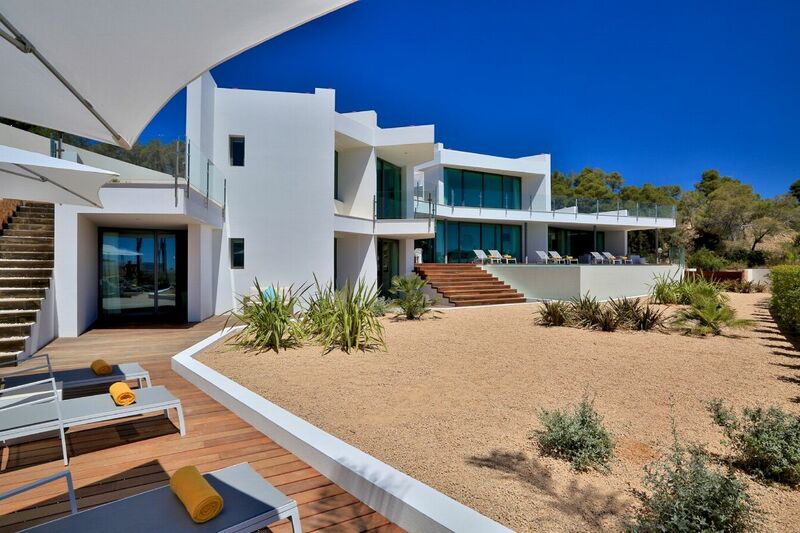 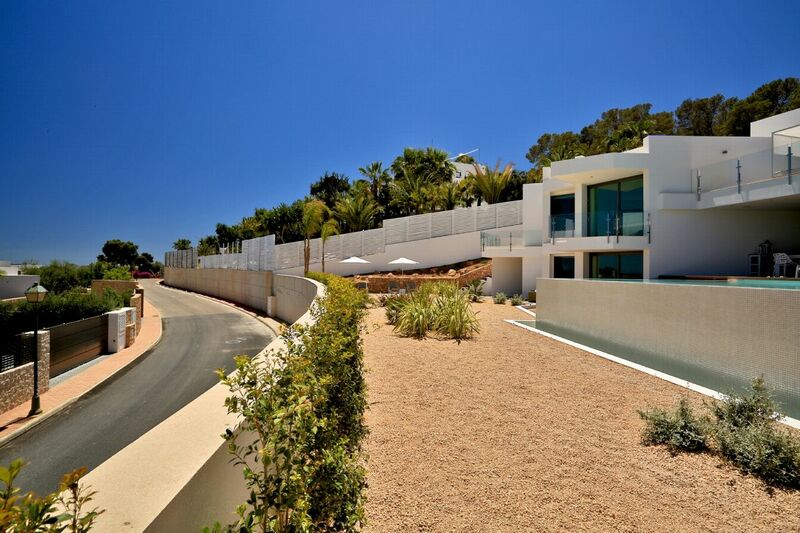 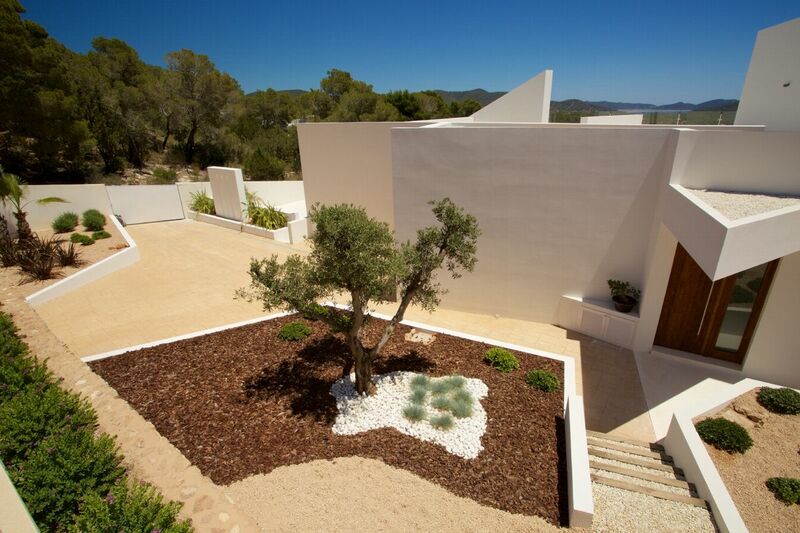 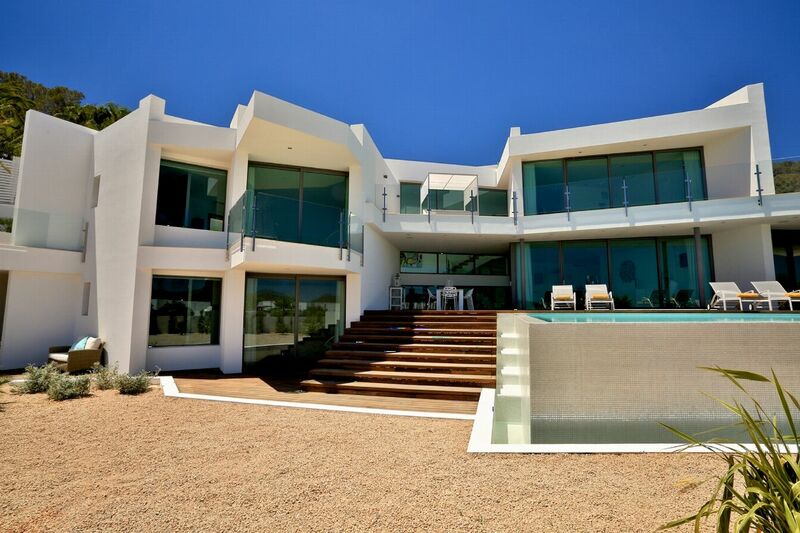 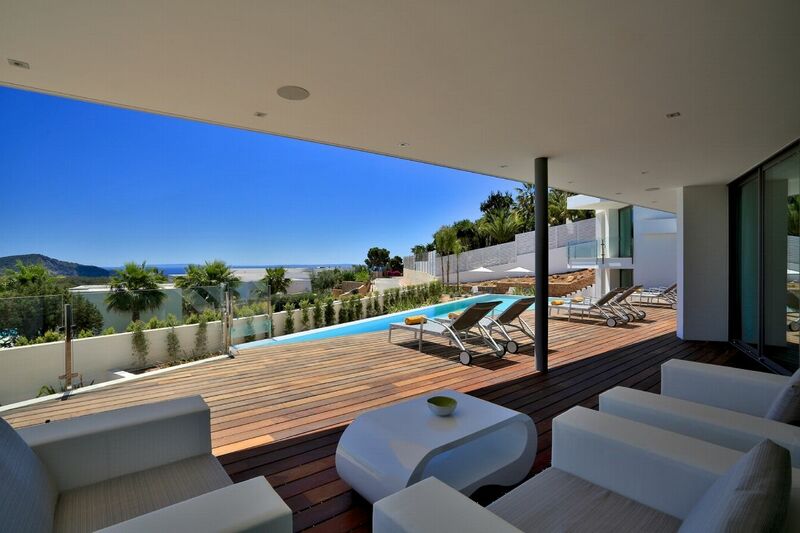 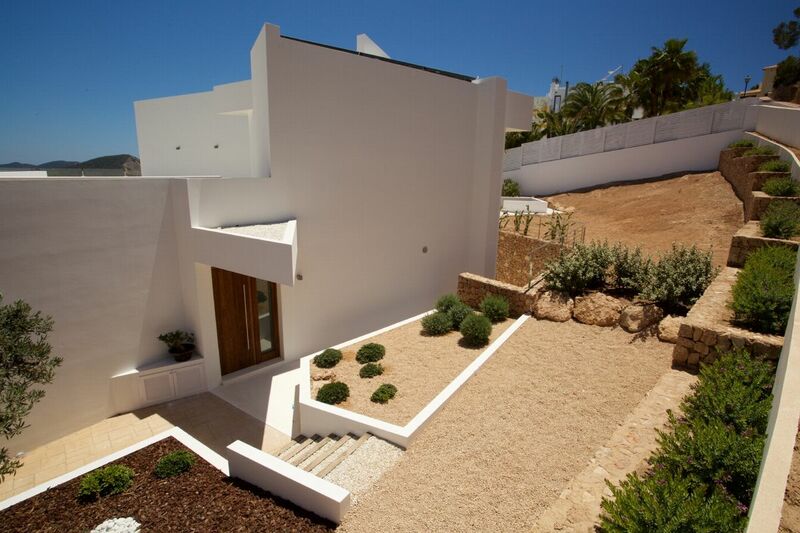 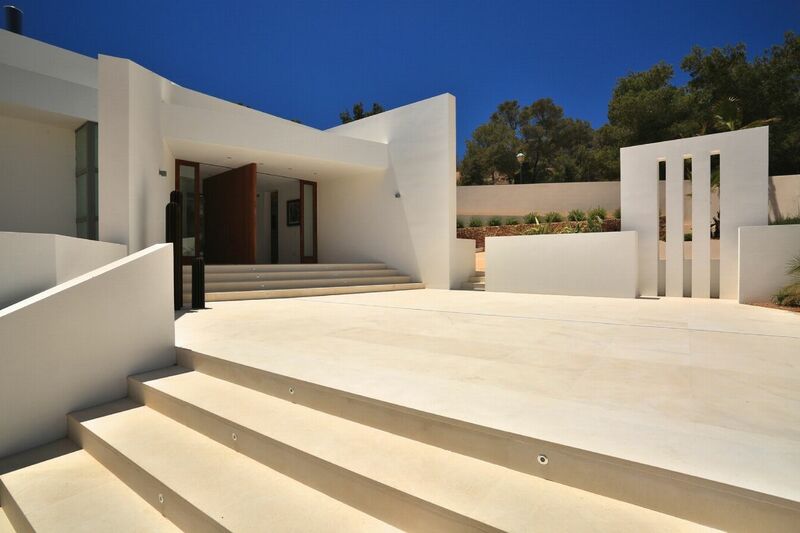 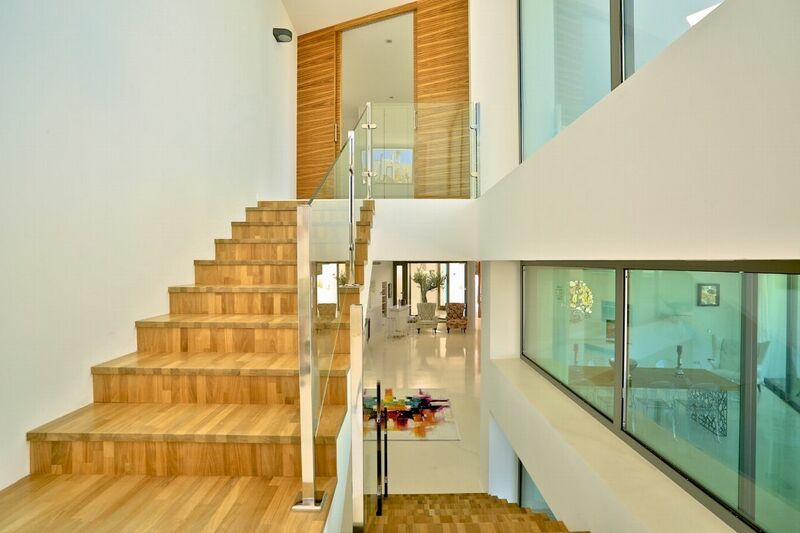 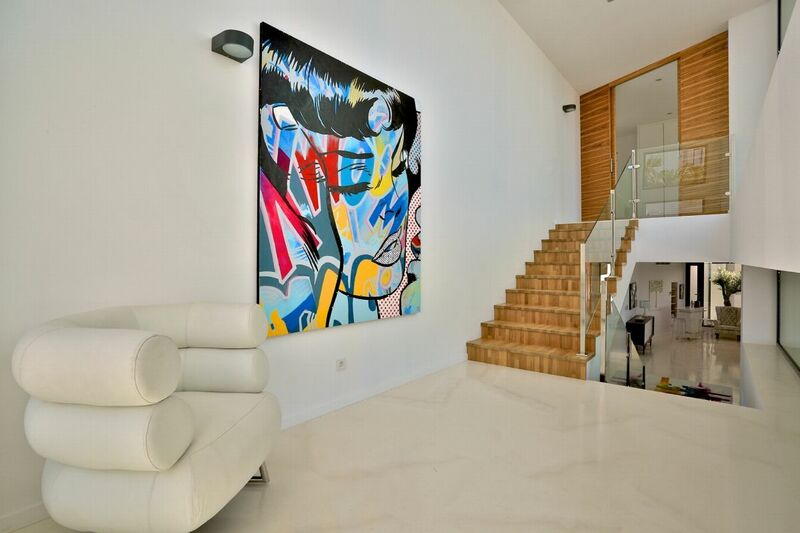 Modern masterpiece with vast terracing and designer finishes. 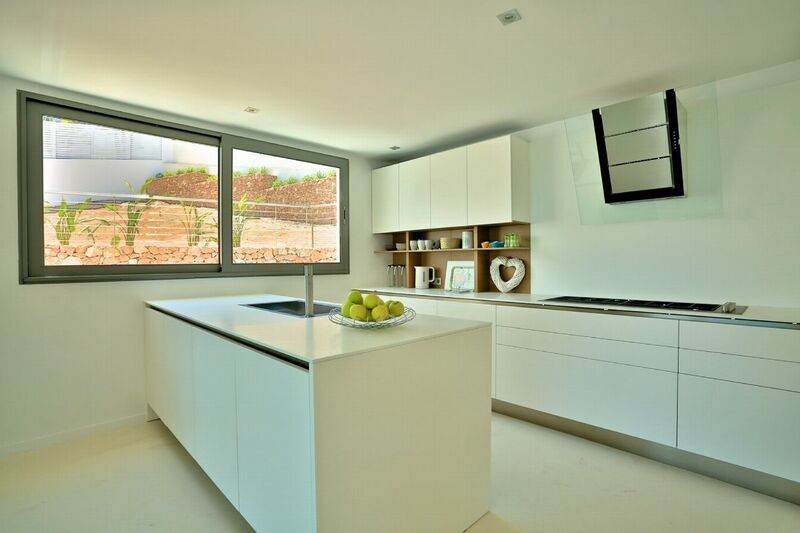 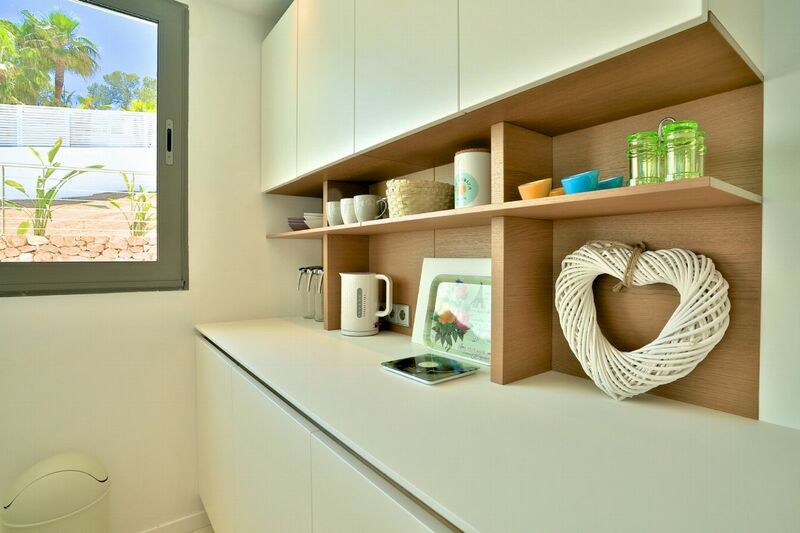 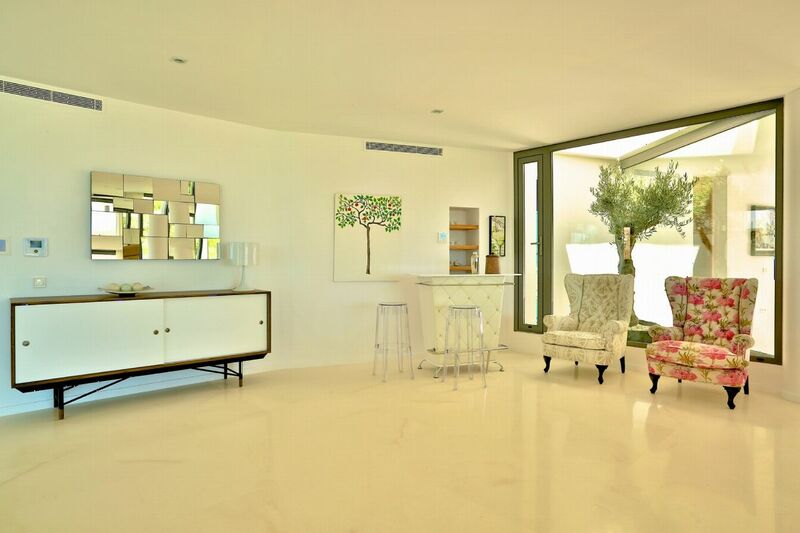 Alegre Belleâ€™s impressive modern style and beautiful interior spaces are a delight. 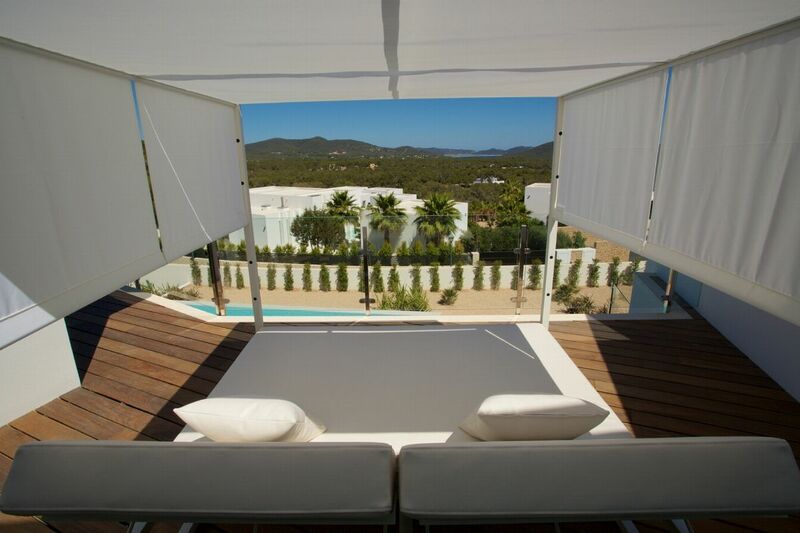 The south-facing pool and gardens look out over a spectacular panoramic vista towards the sparkling blue bay of Es Torrent. 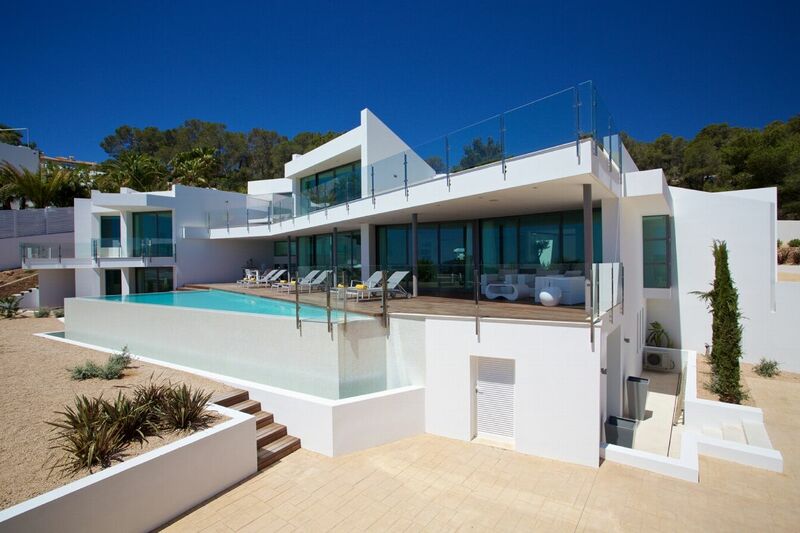 This part of Ibizaâ€™s south coast is home to pretty coves and white pebble beaches, such as those at nearby Es Cubells. 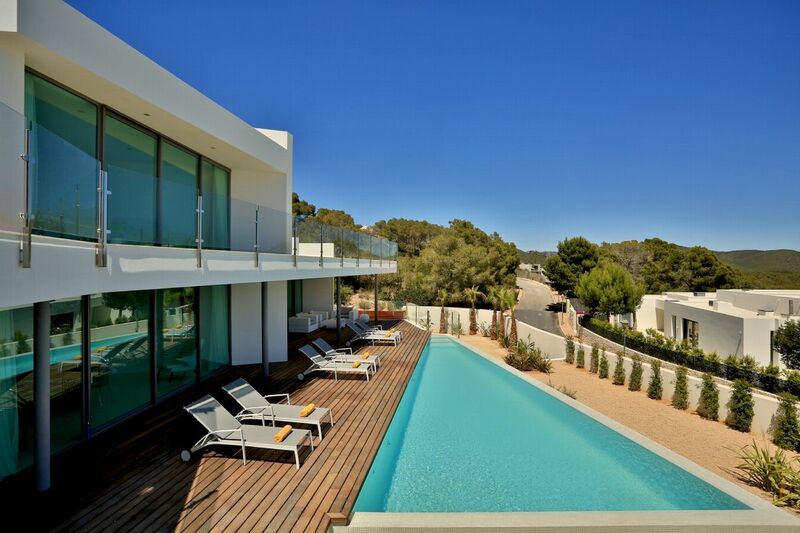 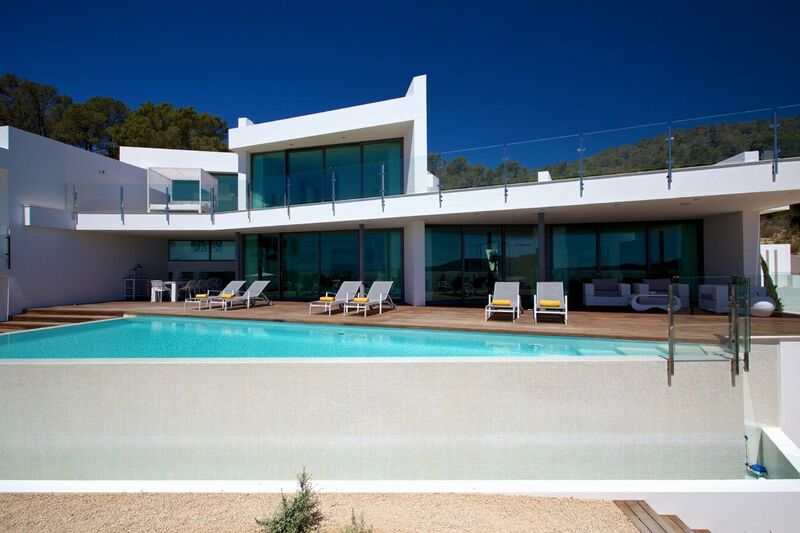 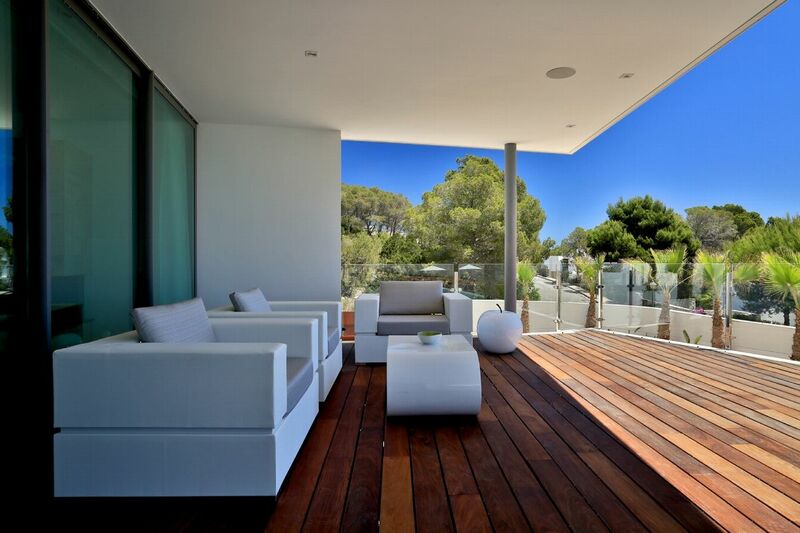 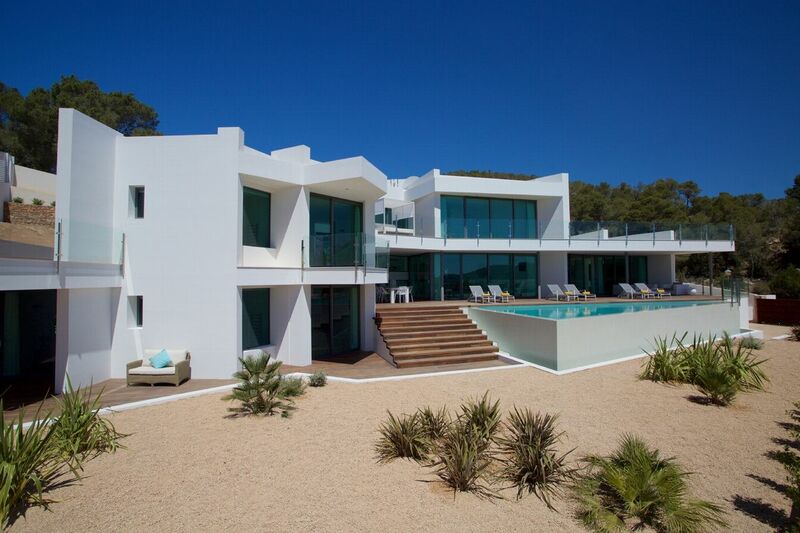 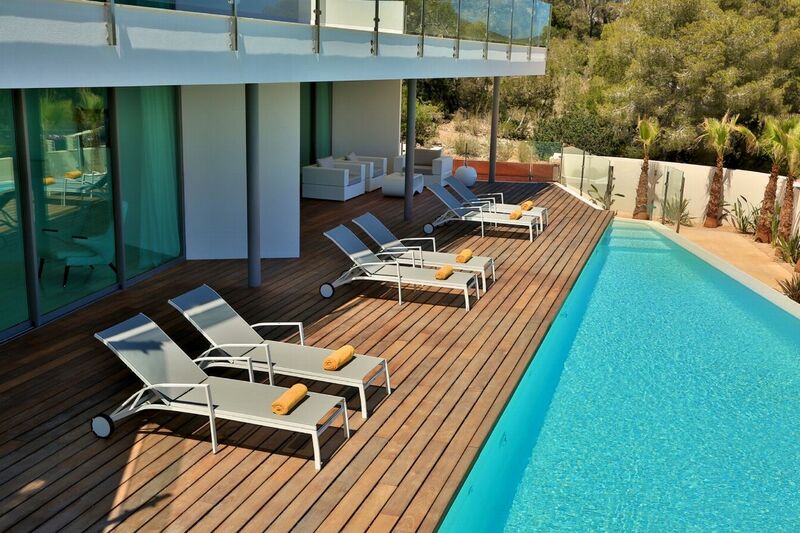 A sleek hardwood deck stretches for the full width of the property, offering shaded lounging and dining spaces and sun-drenched spaces where you can pull up a lounger and soak up some Ibizan sunshine or dip your toes in the stunning infinity pool. 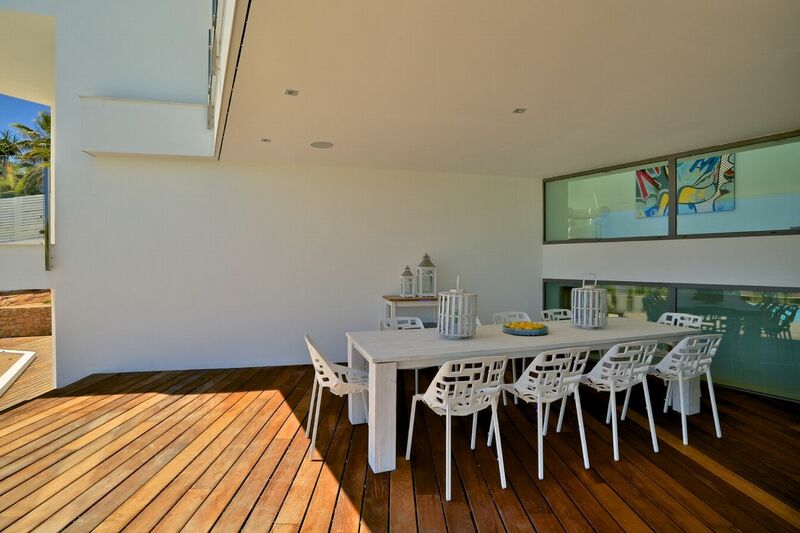 Polished white stone floors stretch throughout the interior, where the large bright kitchen offers a sociable interior dining area, with table seating ten, and opens straight onto the deck. 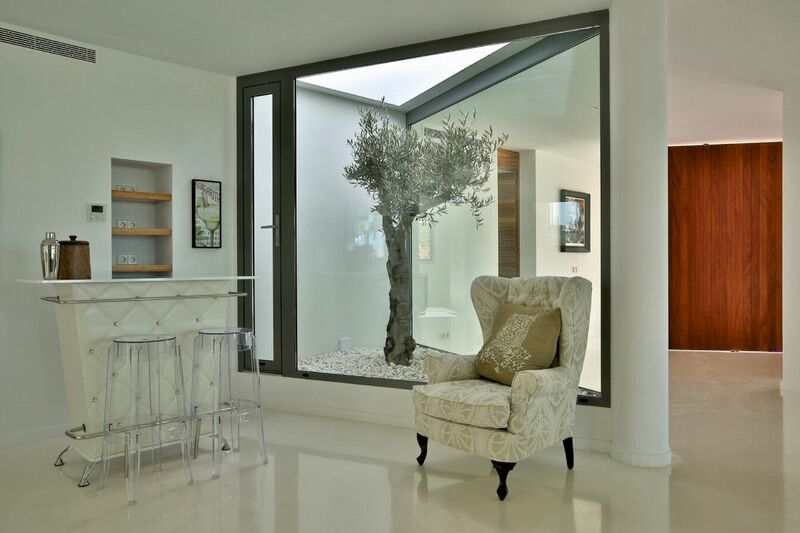 Wind around the huge glass frontage, and the living areas include sociable sofa seating and a cosy fireplace nook with Bali limestone and black granite fireplace. 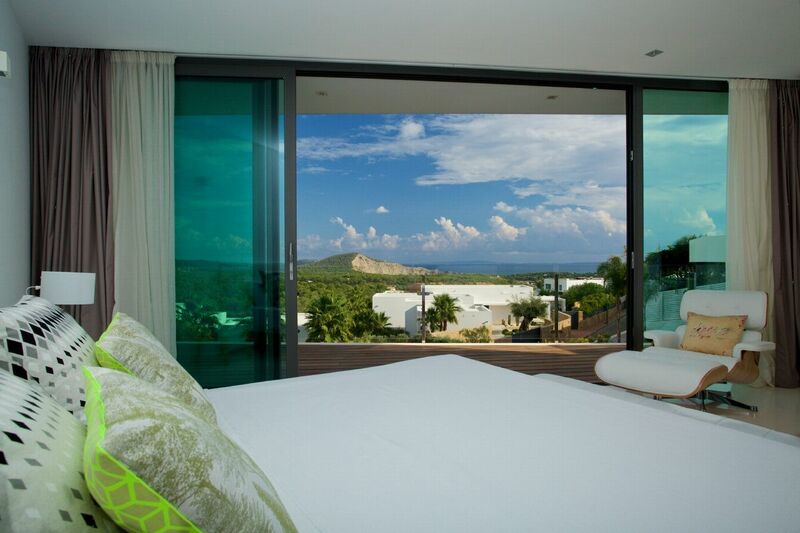 All share the sparkling sea views and open onto the terrace. 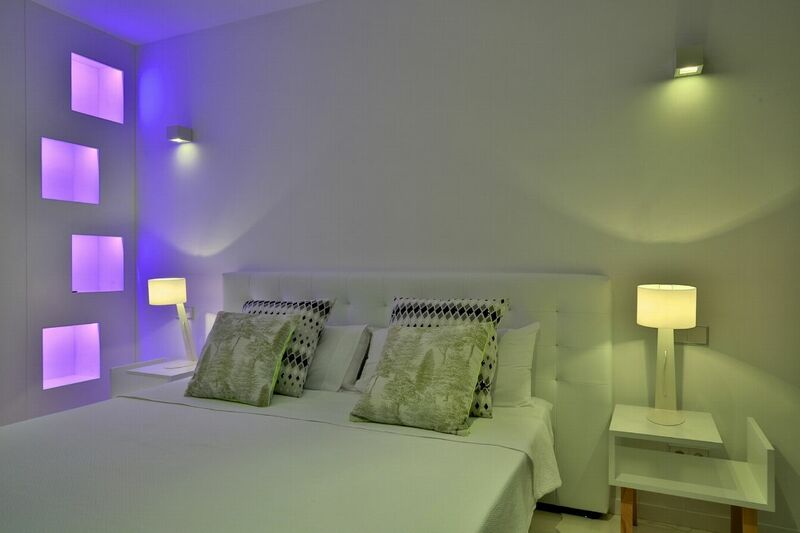 Five spacious double bedrooms, each with an immaculate en-suite, offer stylish guest accommodation. 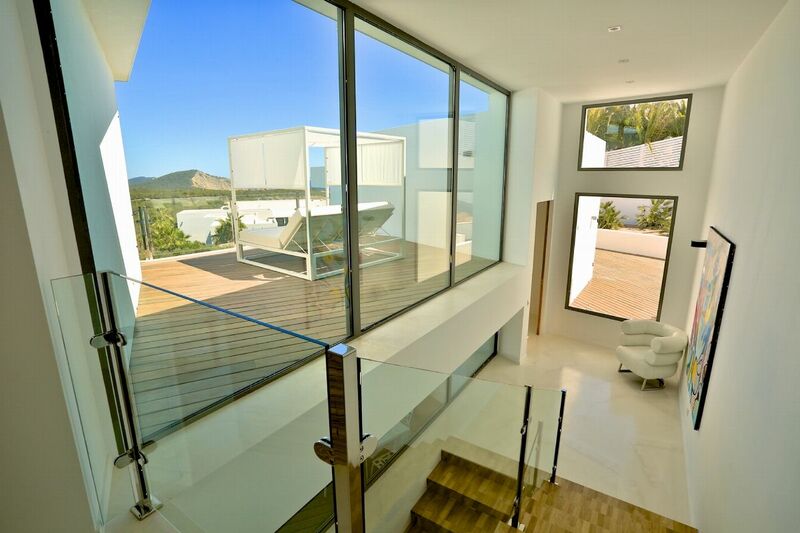 One has direct access onto the ground-floor terrace. 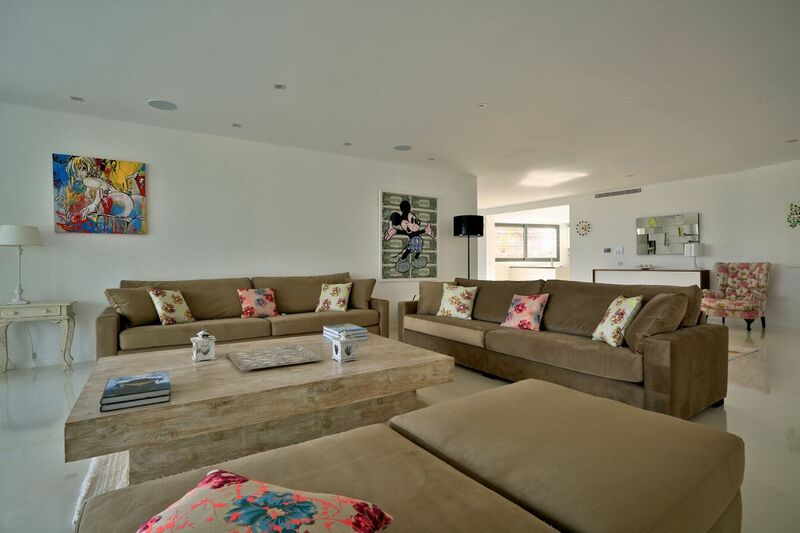 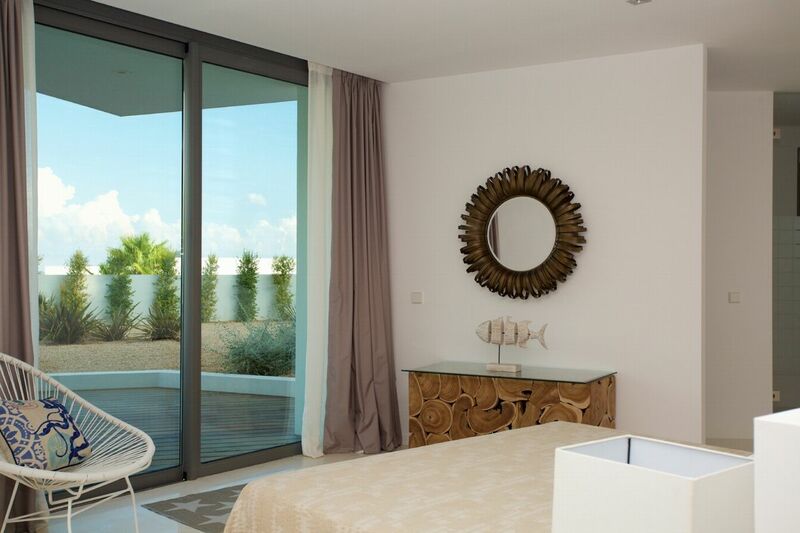 On the upper floor, two of the generously sized double bedrooms deliver more amazing sea views. 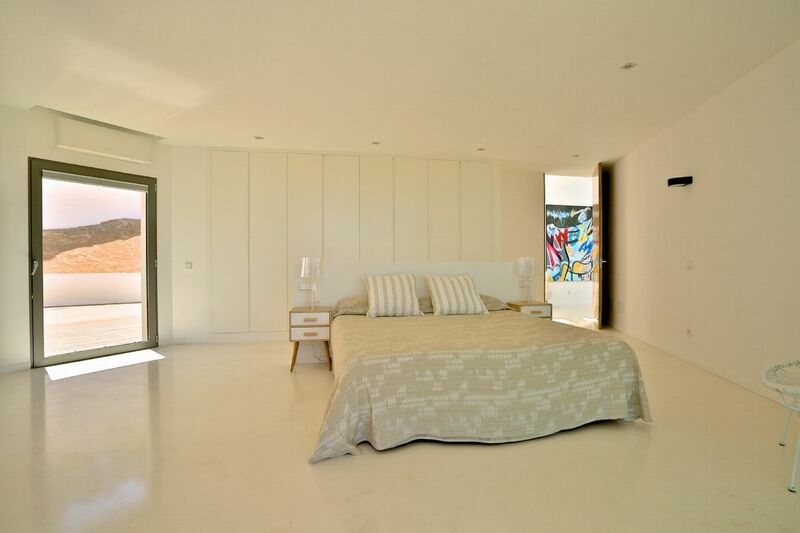 The master suite takes up the whole of the top floor of the house. 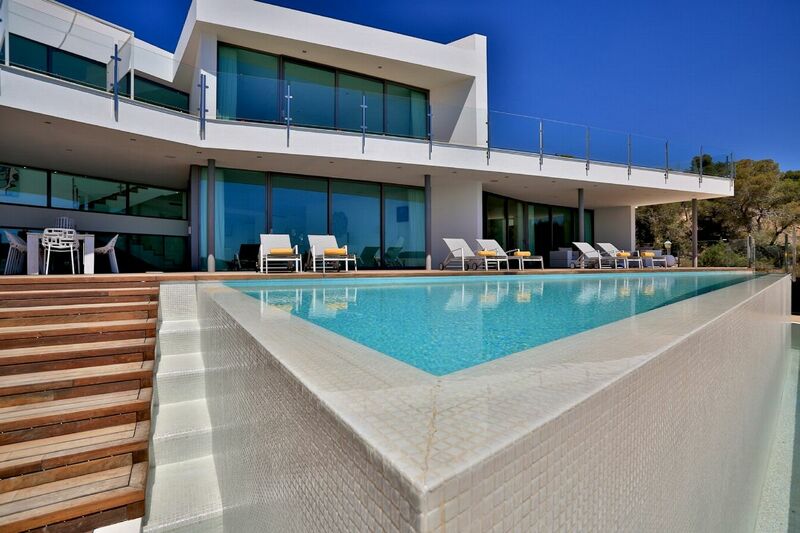 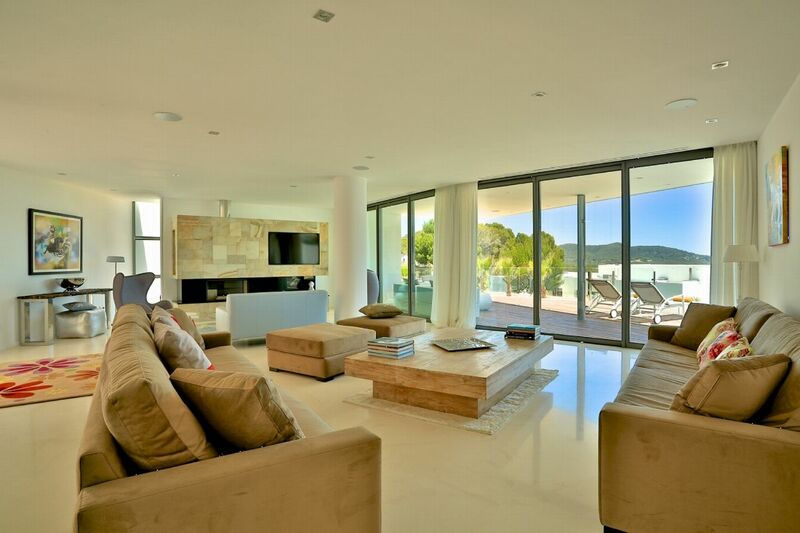 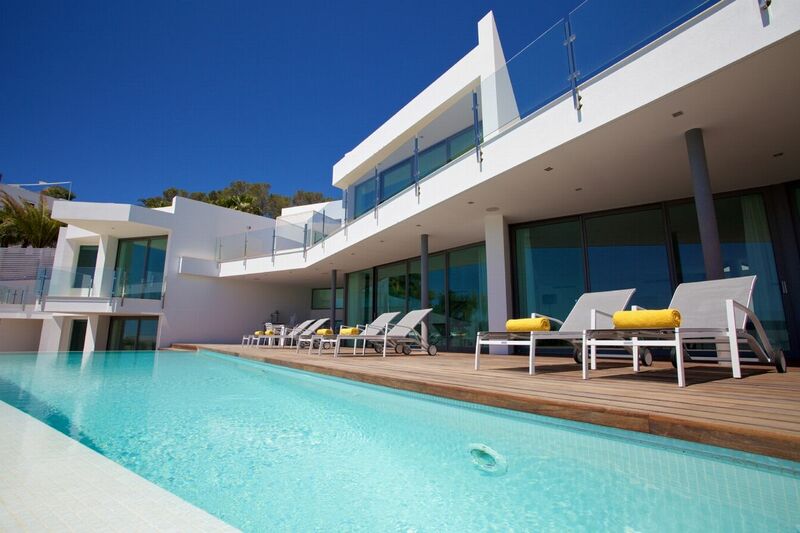 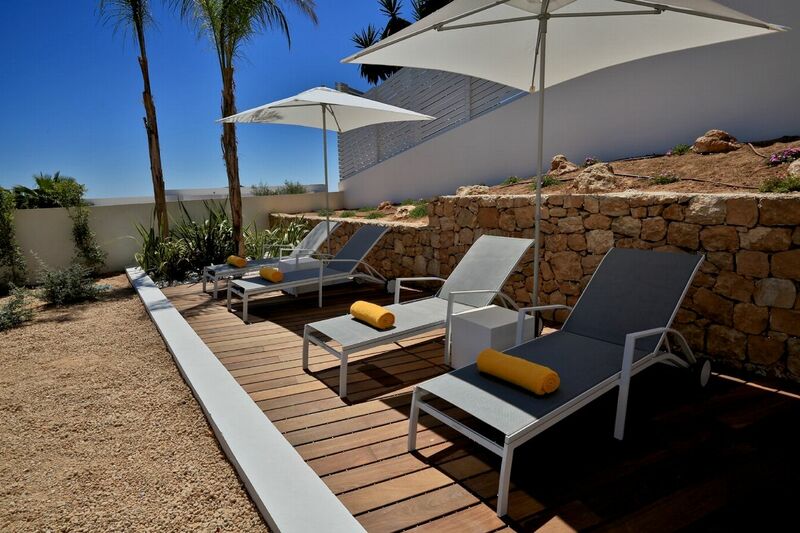 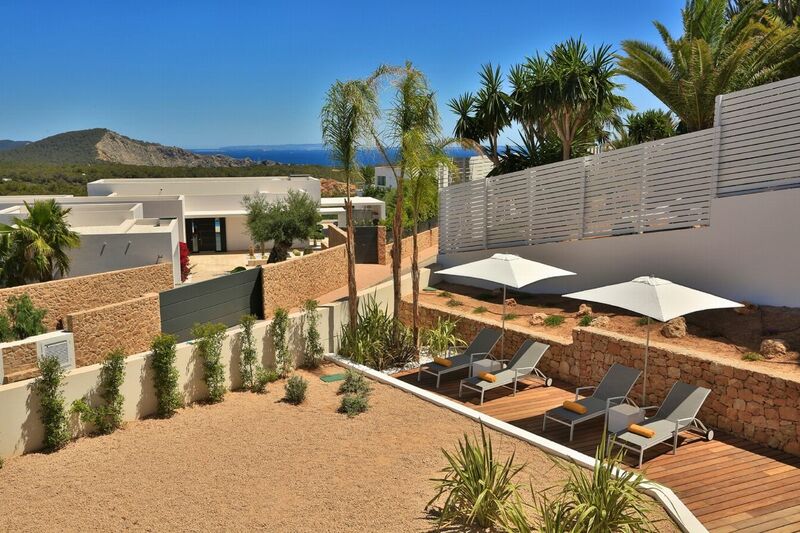 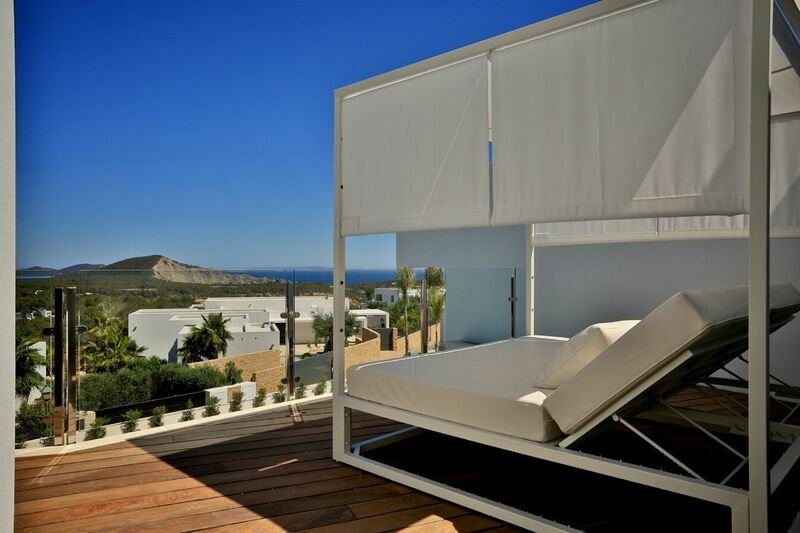 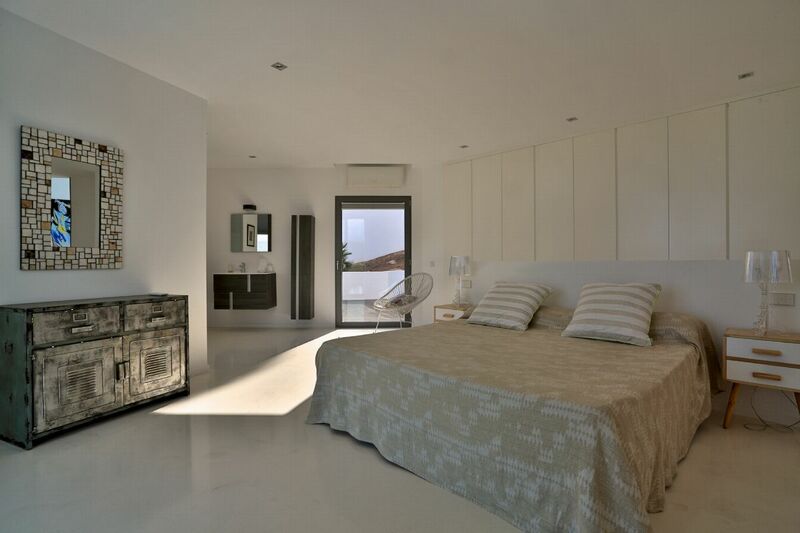 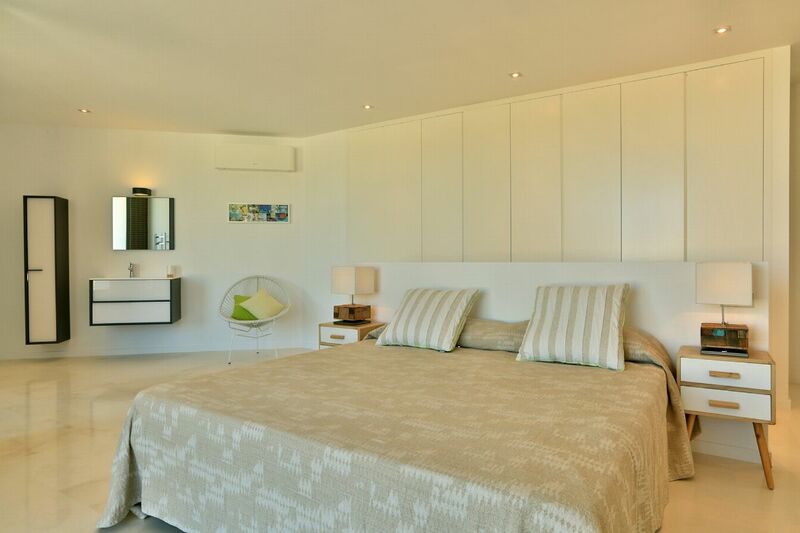 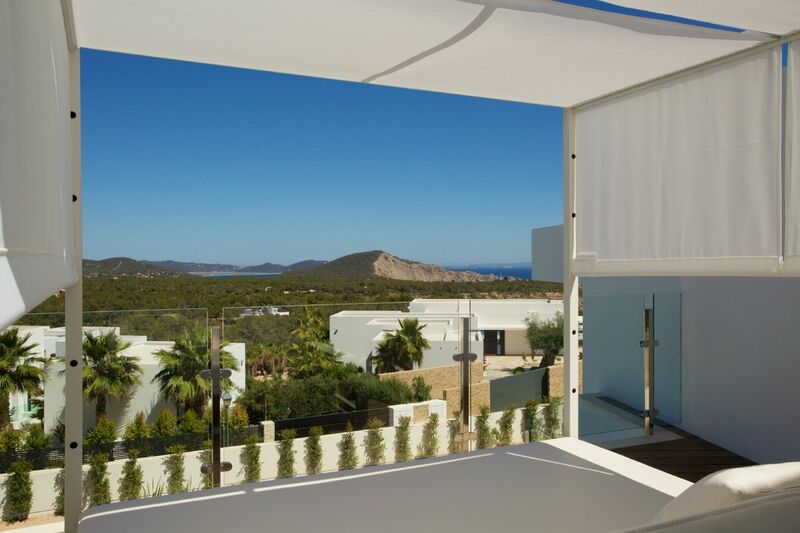 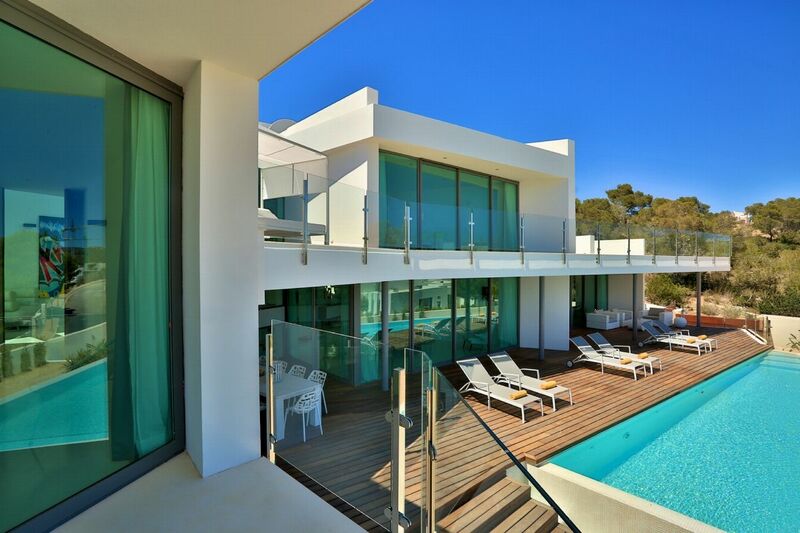 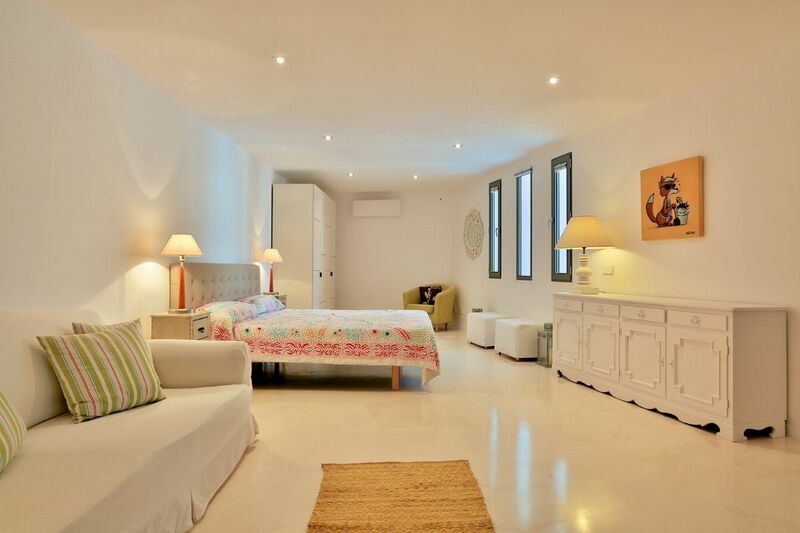 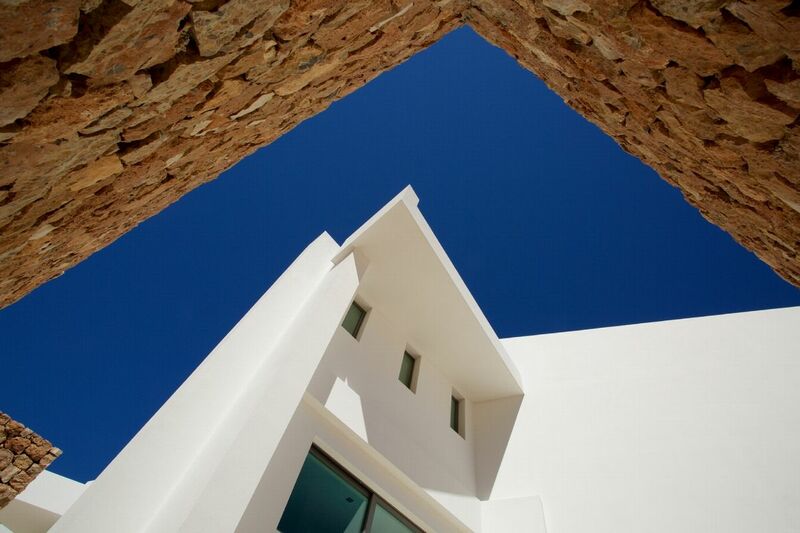 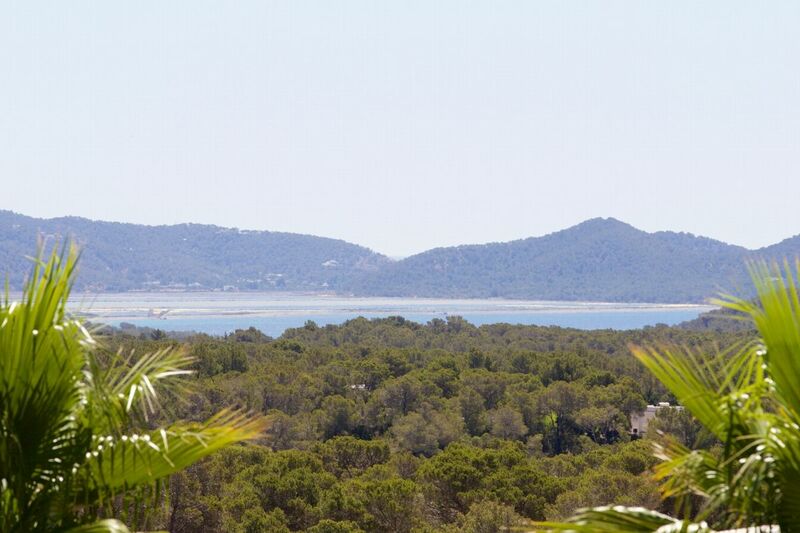 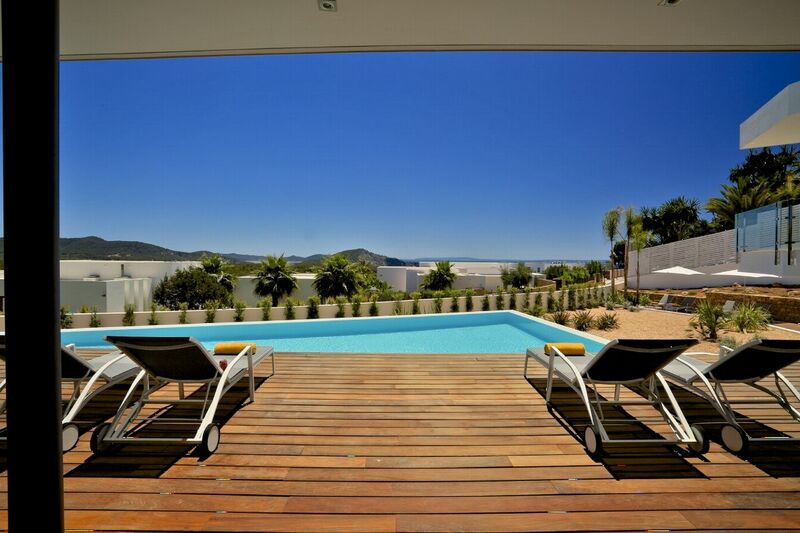 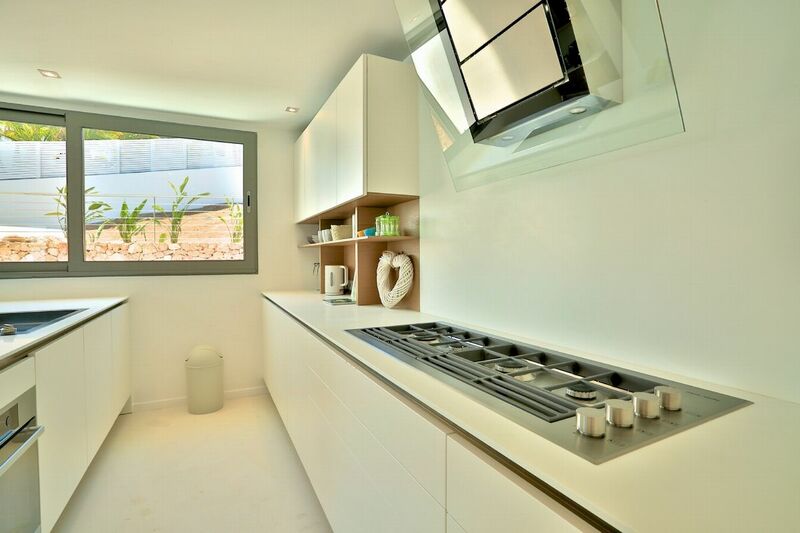 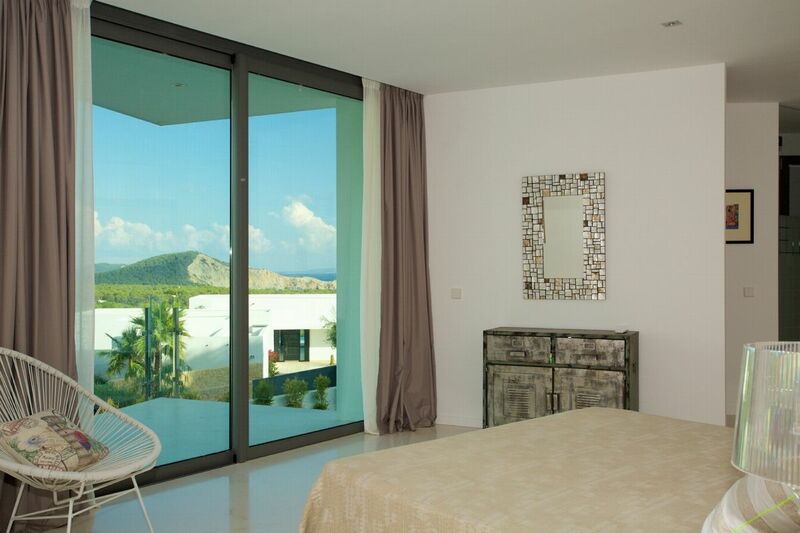 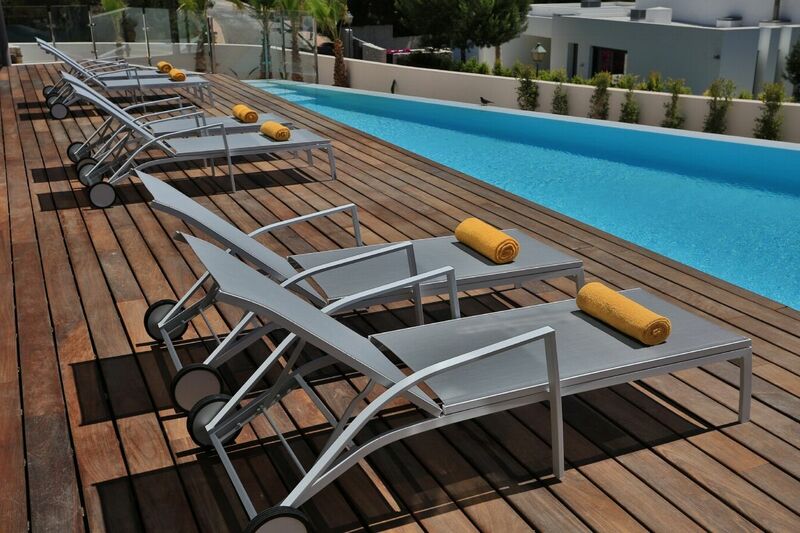 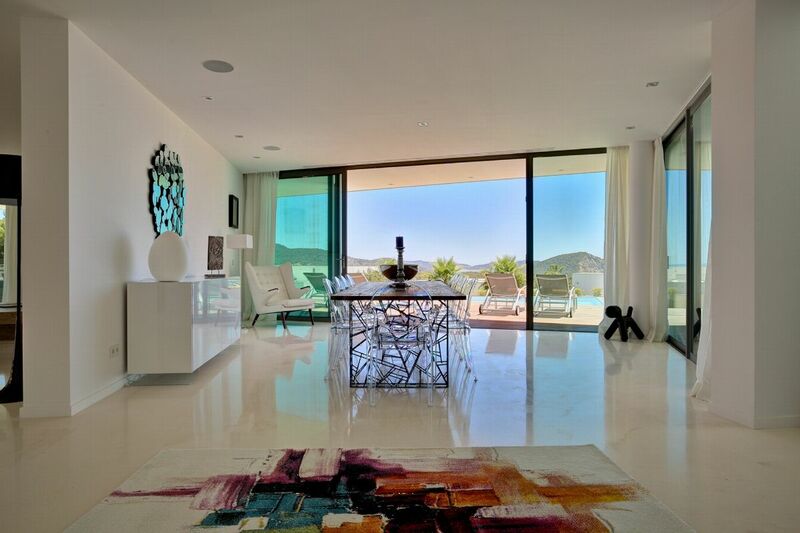 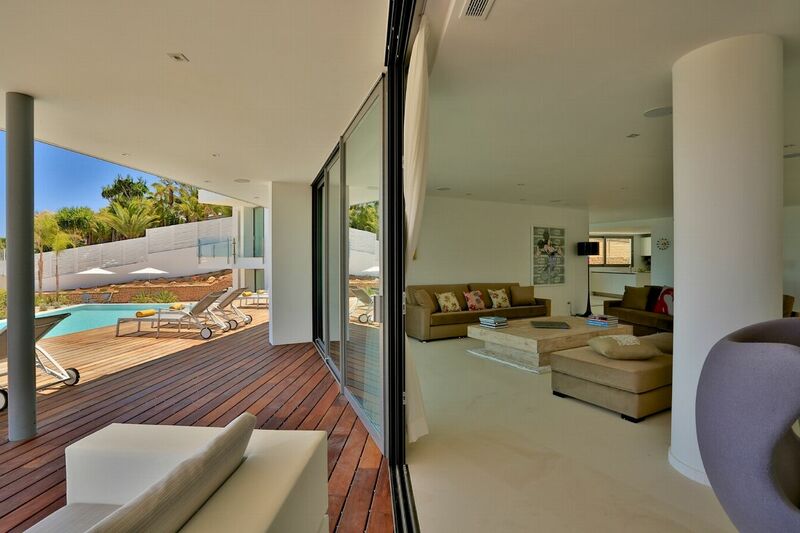 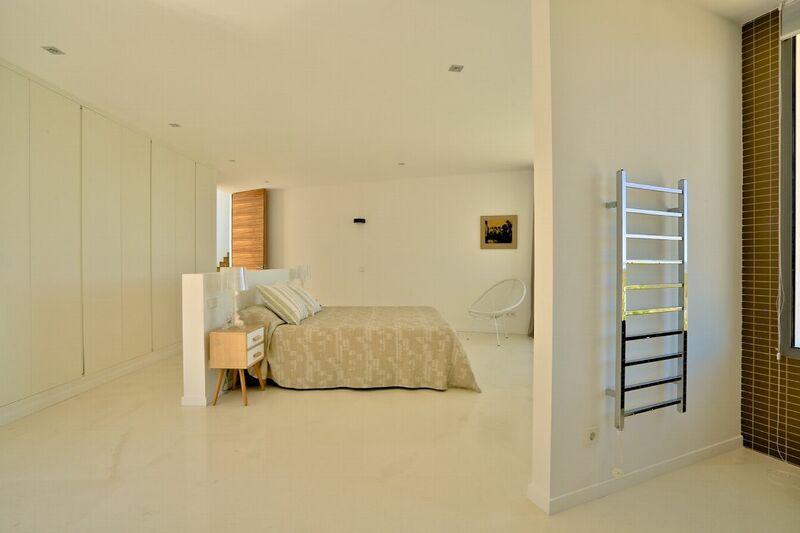 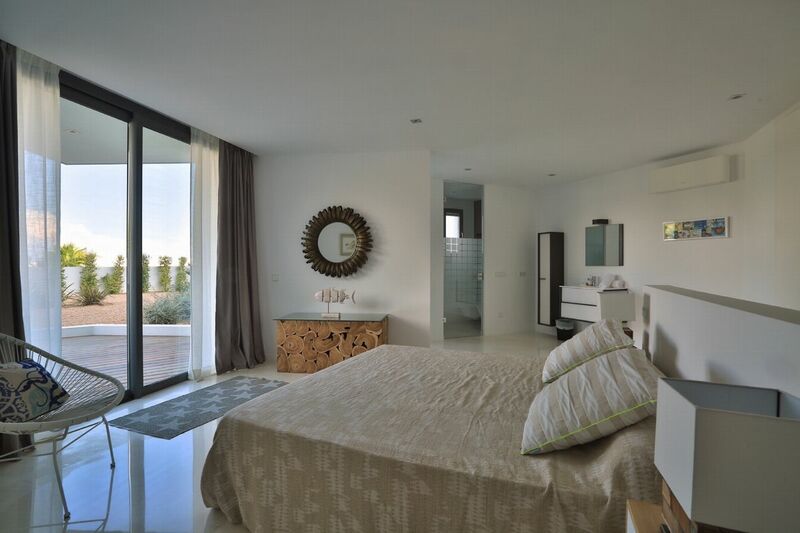 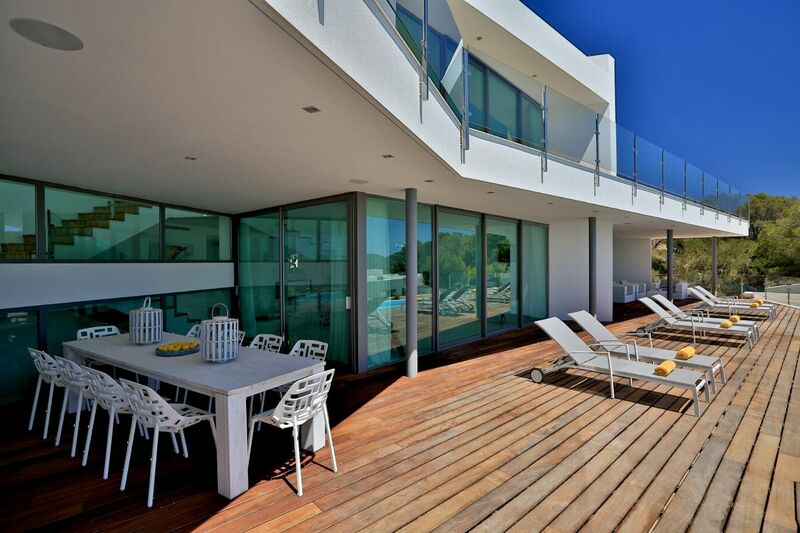 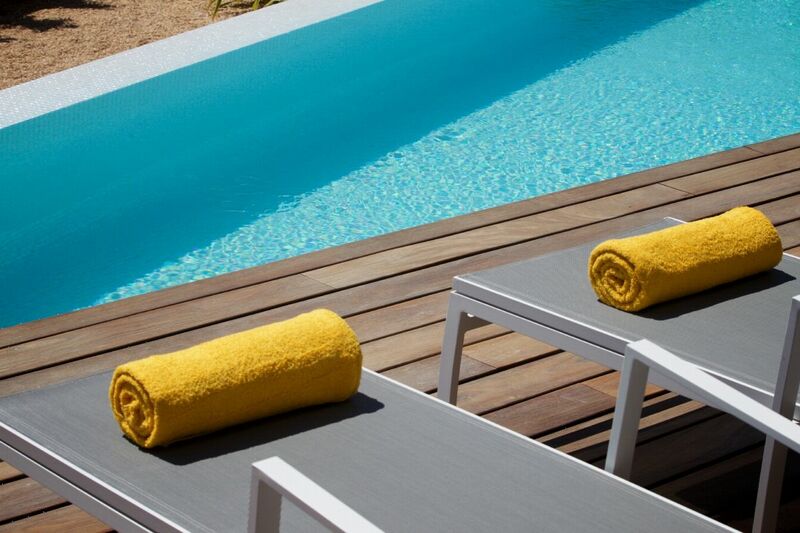 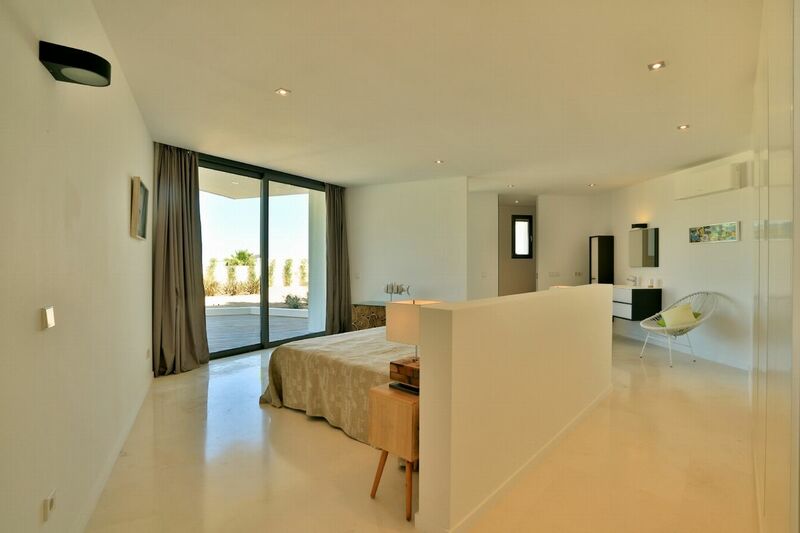 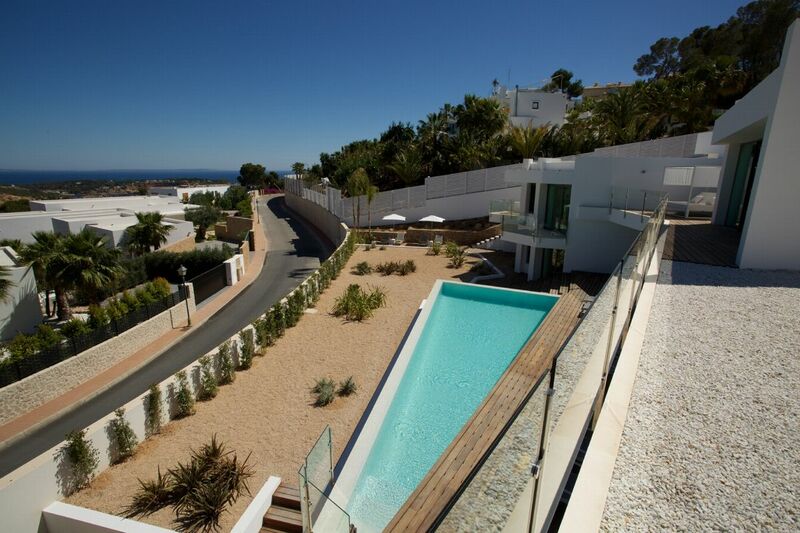 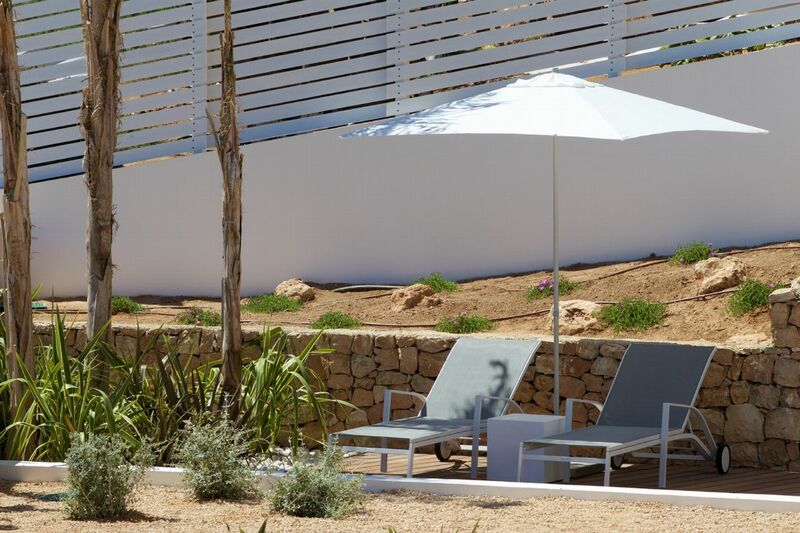 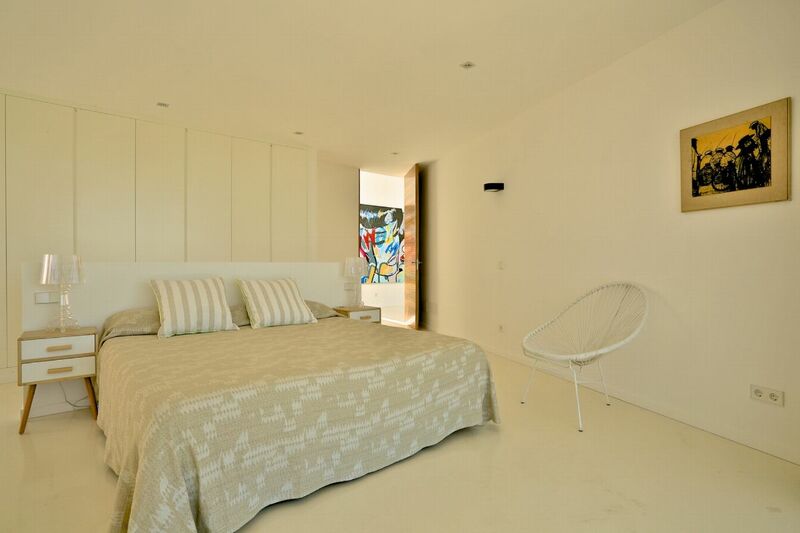 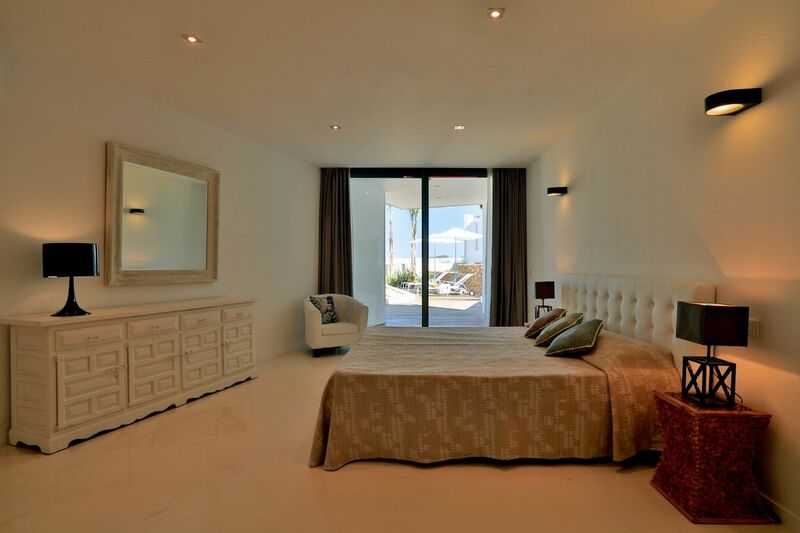 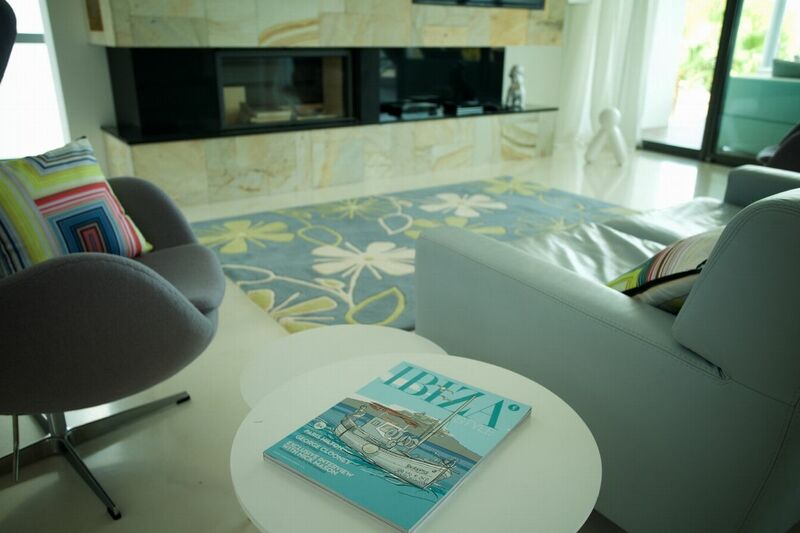 From its private terrace, you can enjoy wonderful views across to Formentera or simply relax on the oversized daybed. 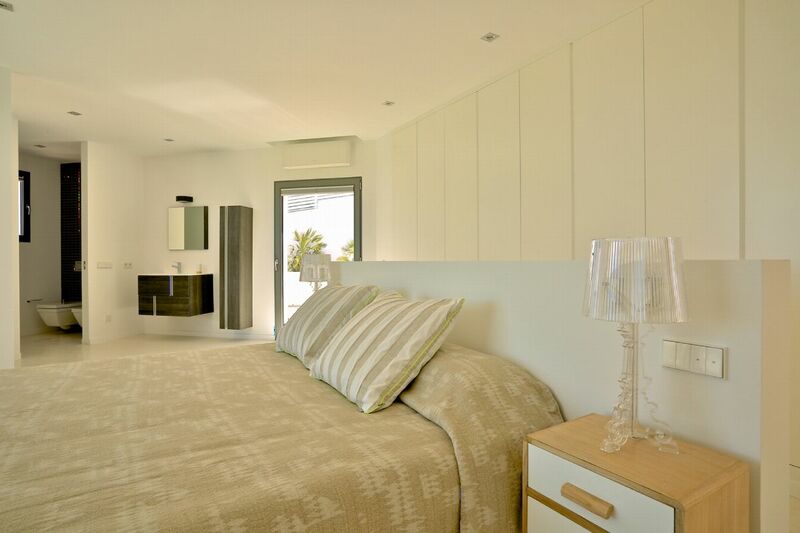 The fifth bedroom is a one-bedroom guest or service apartment, with en-suite, private courtyard and internal and external access. 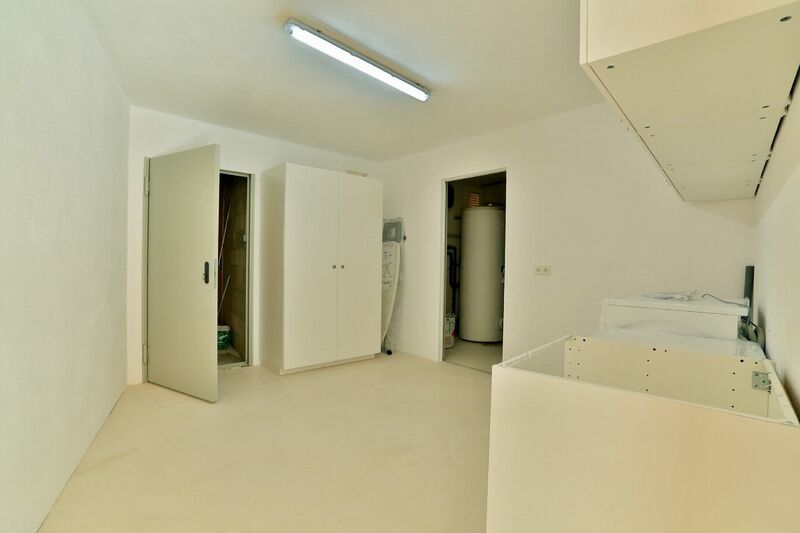 The laundry room is also accessed off this lower floor. 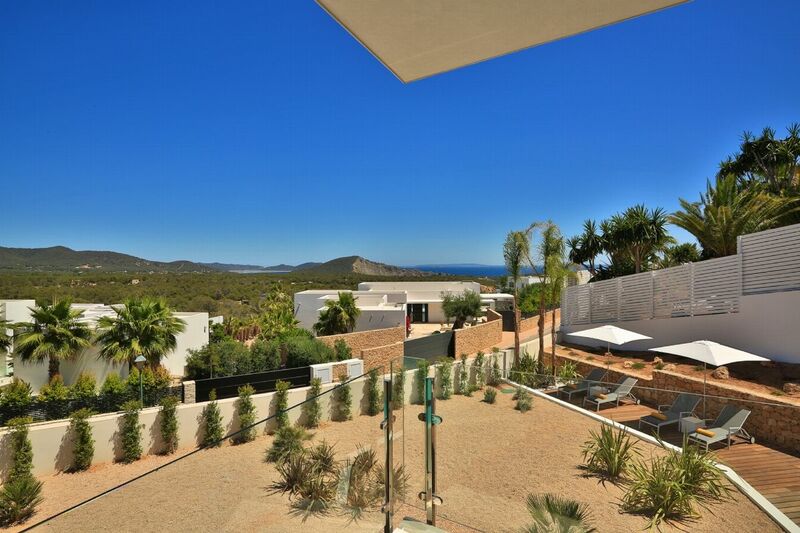 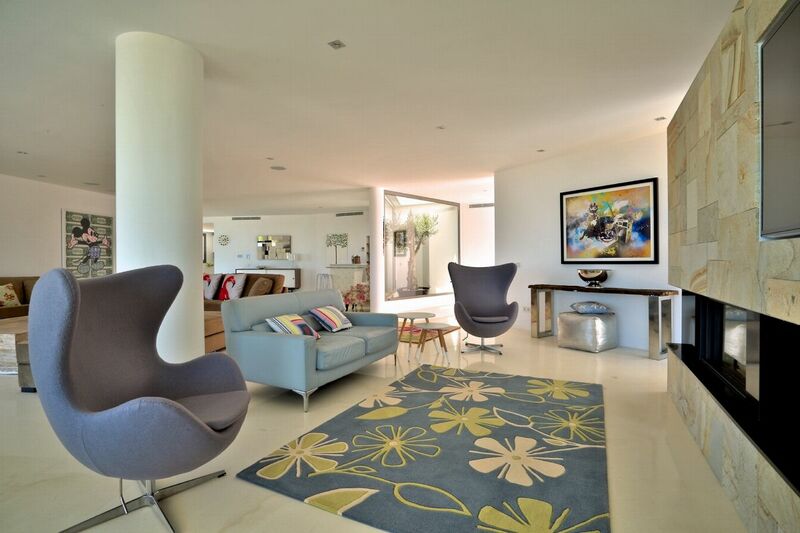 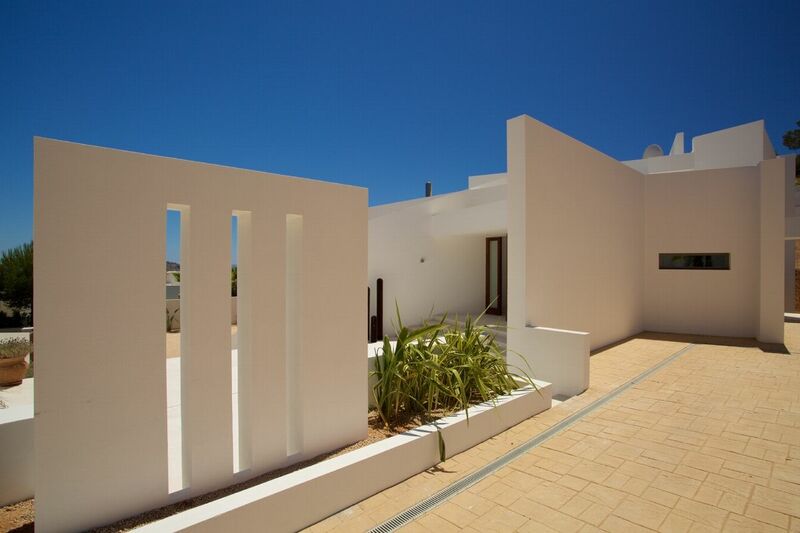 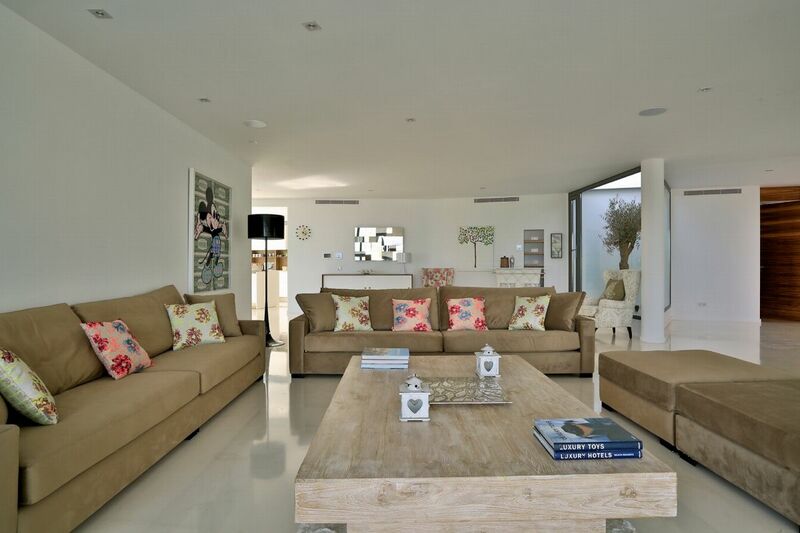 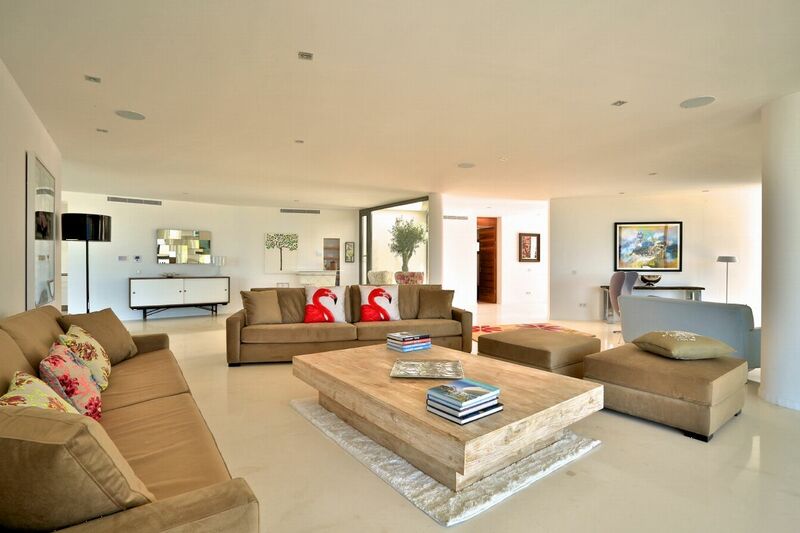 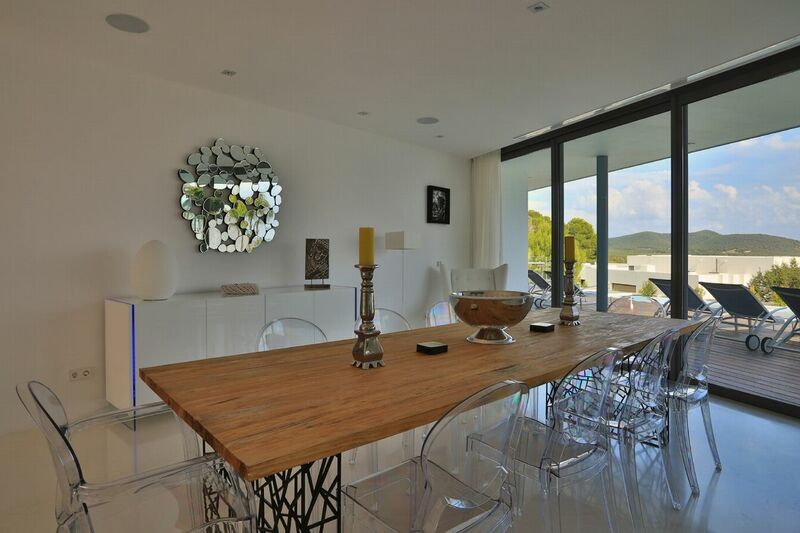 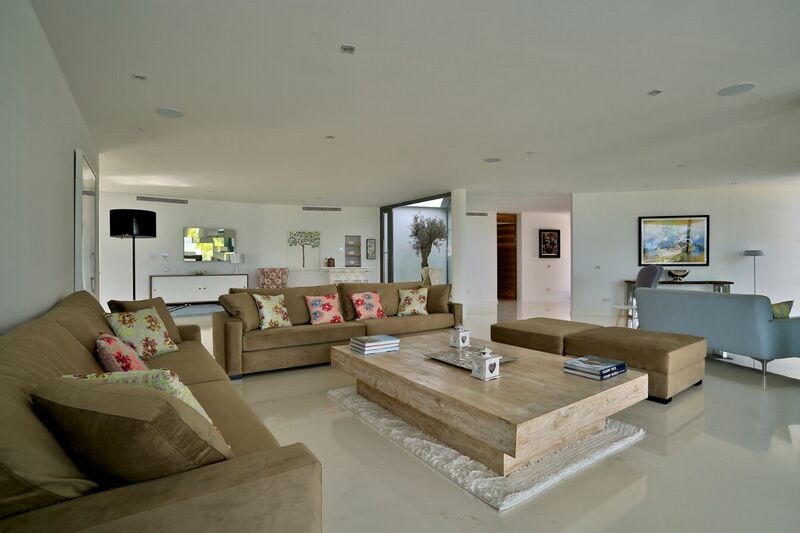 A superb home on a gated community that delivers extra space and wonderful sea views. 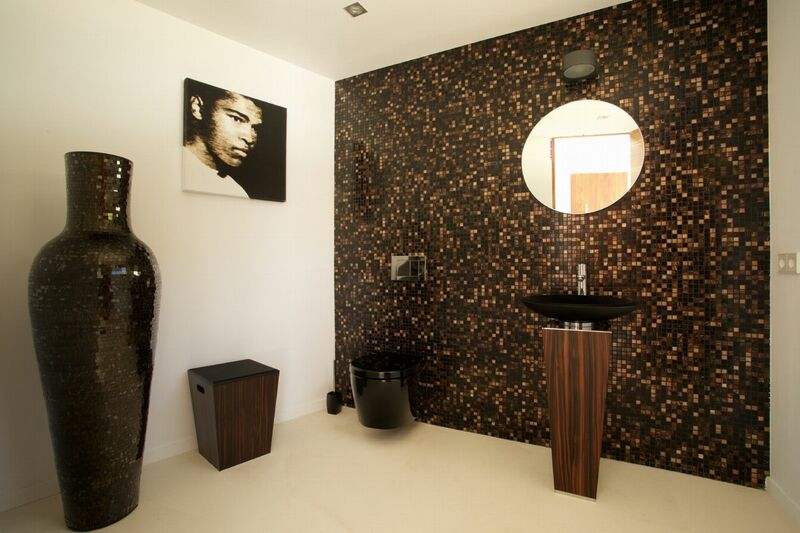 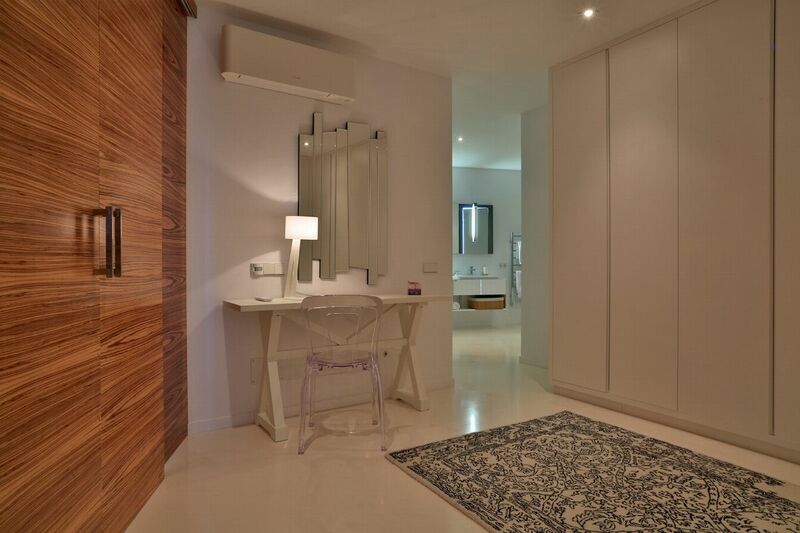 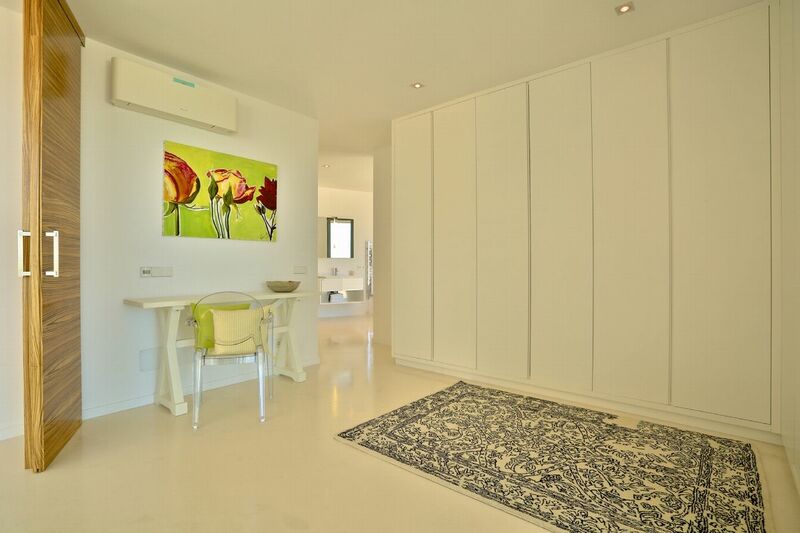 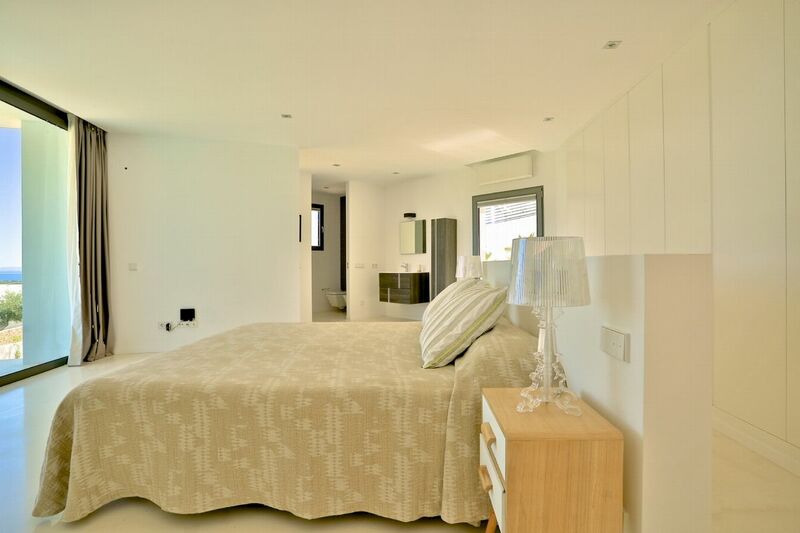 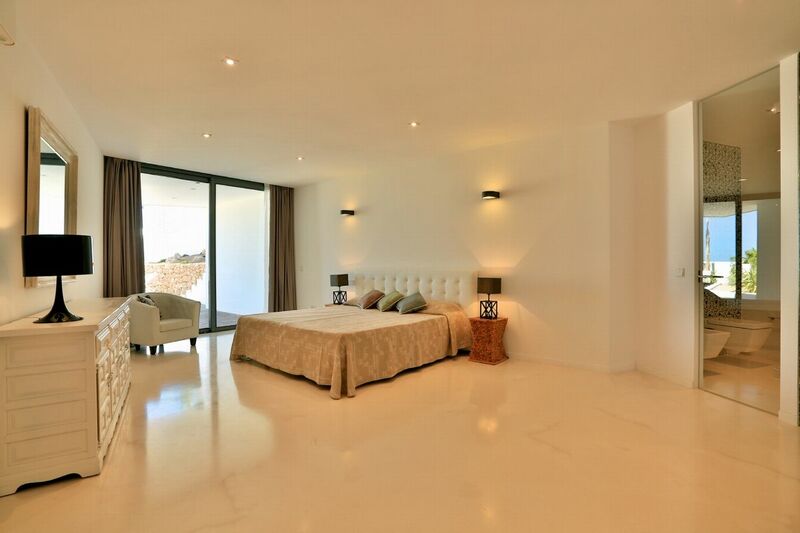 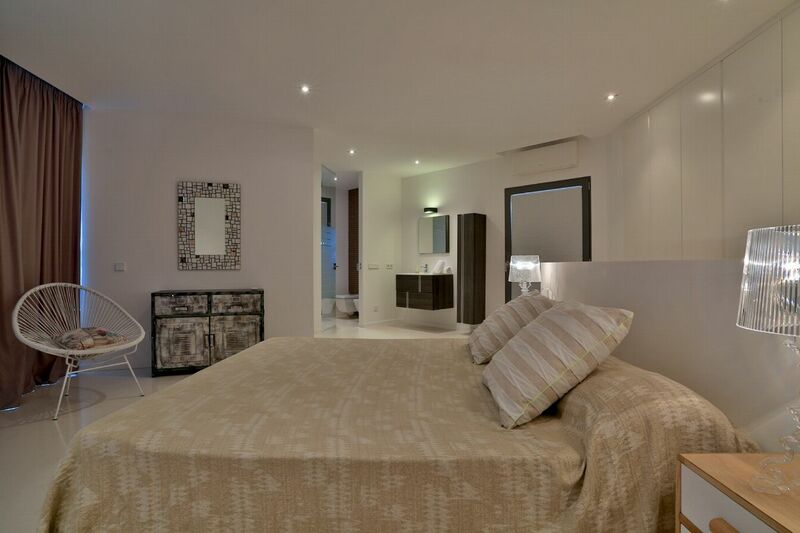 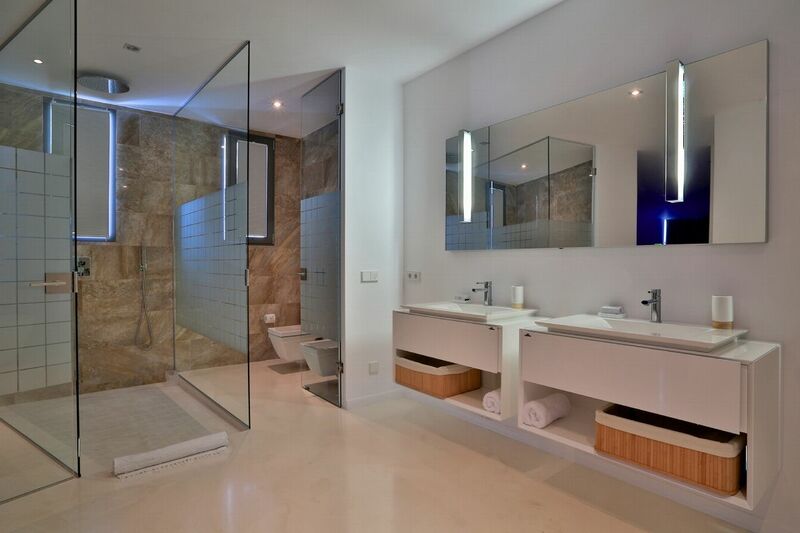 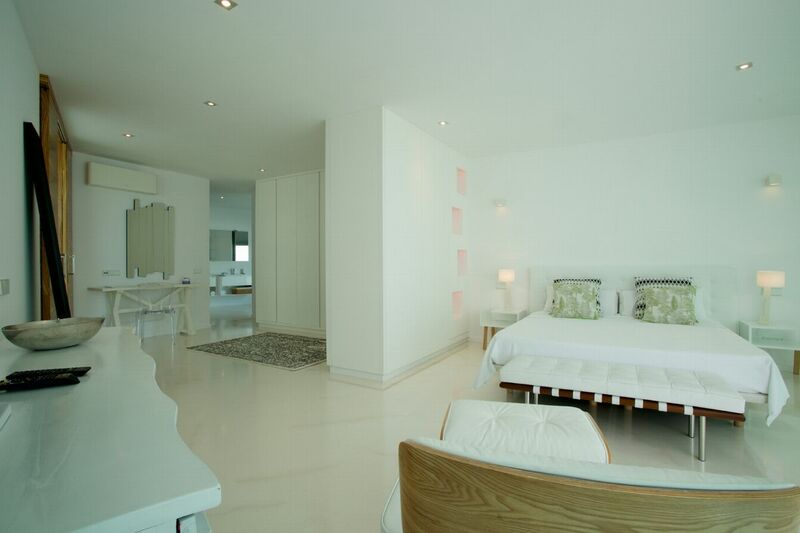 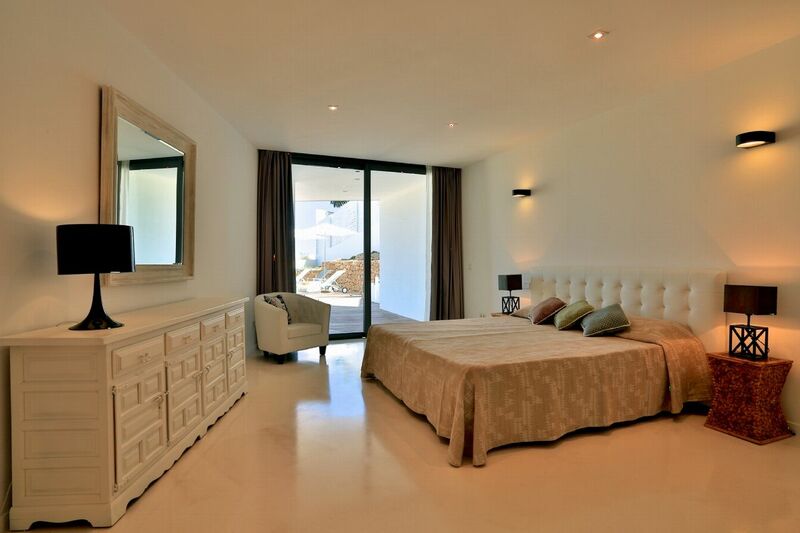 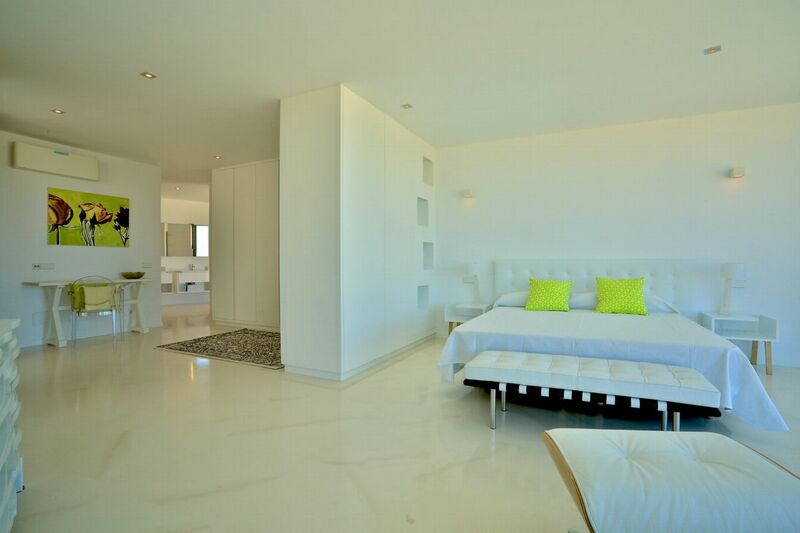 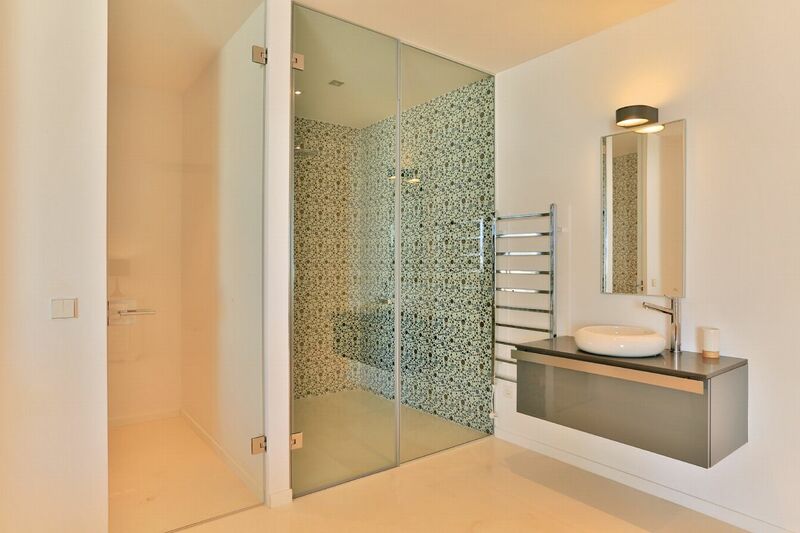 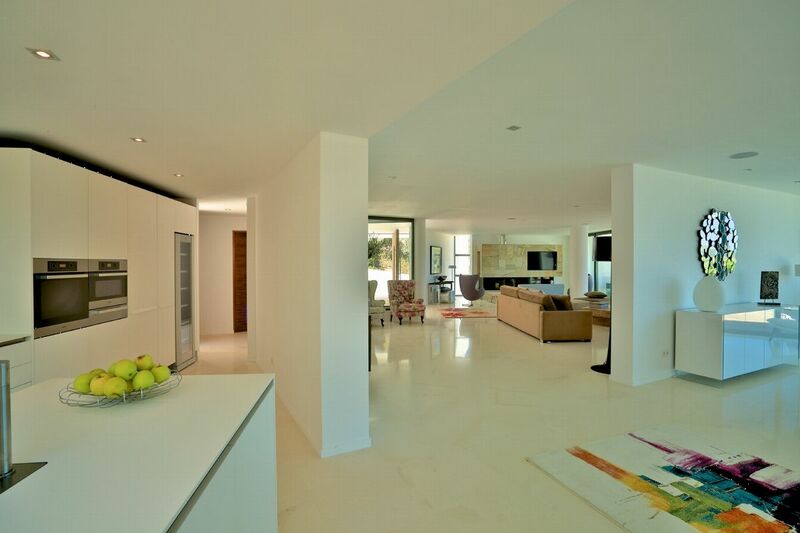 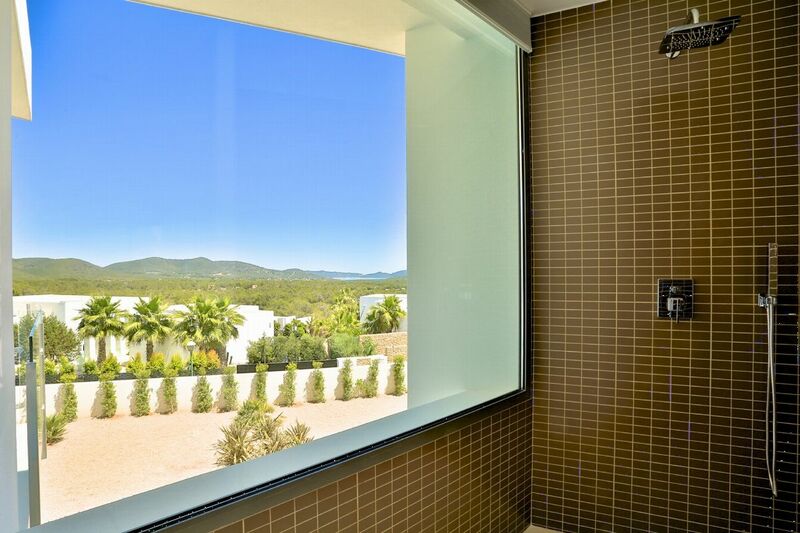 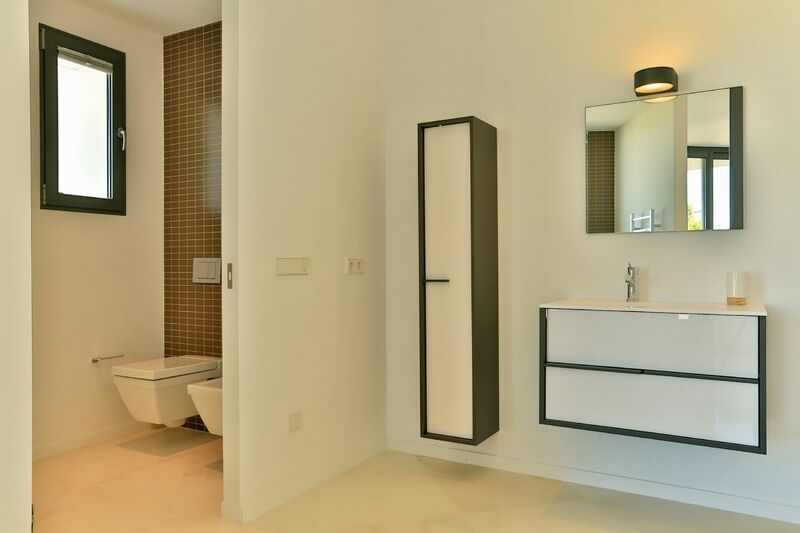 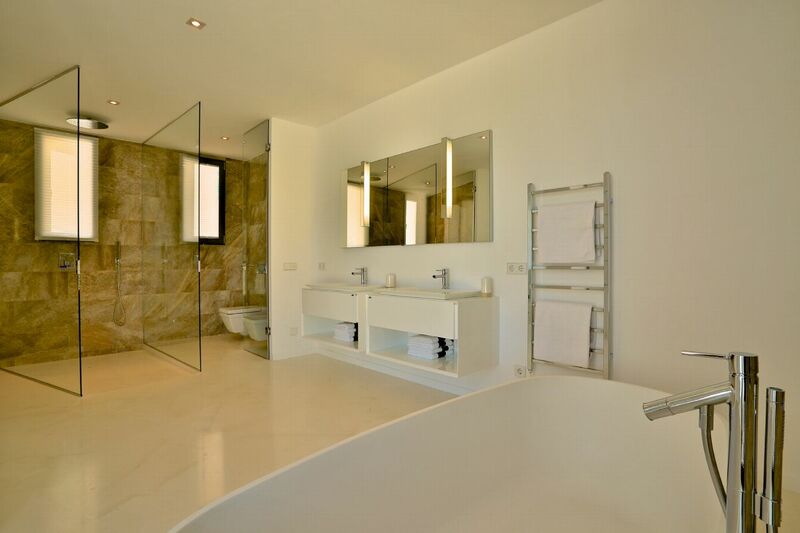 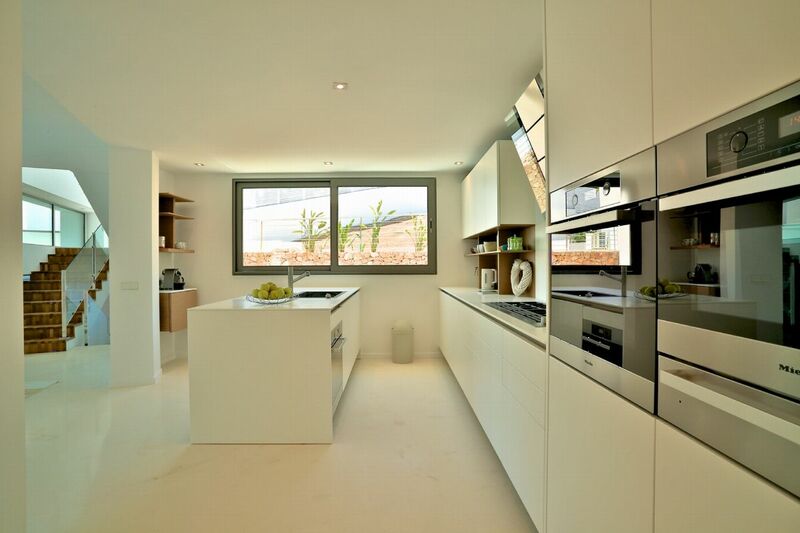 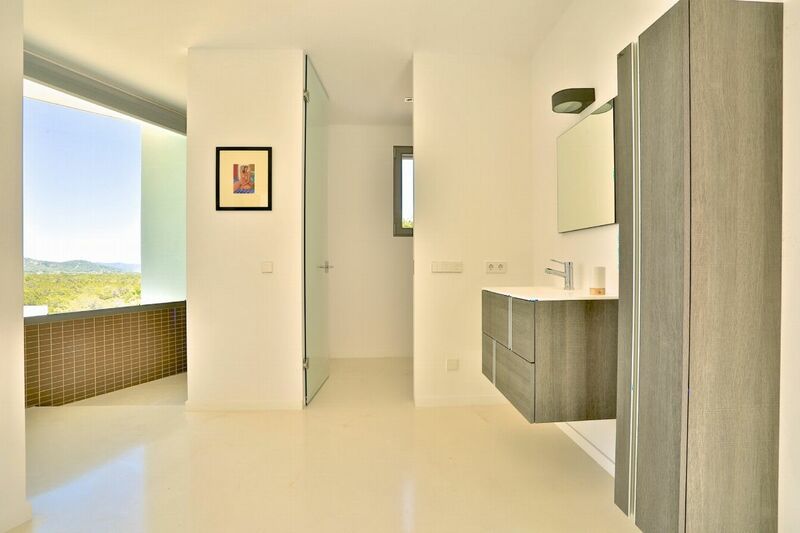 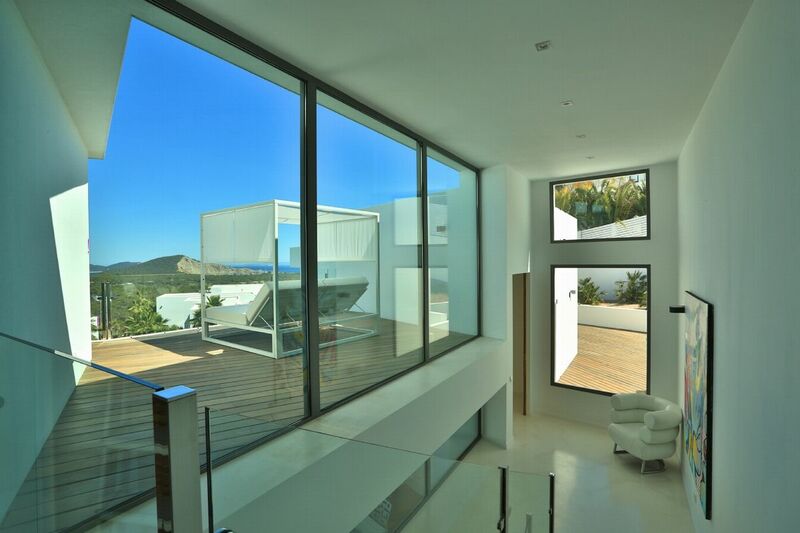 Master Bedroom, double bathroom, fitted dressing room, private terrace and outdoor sitting area. 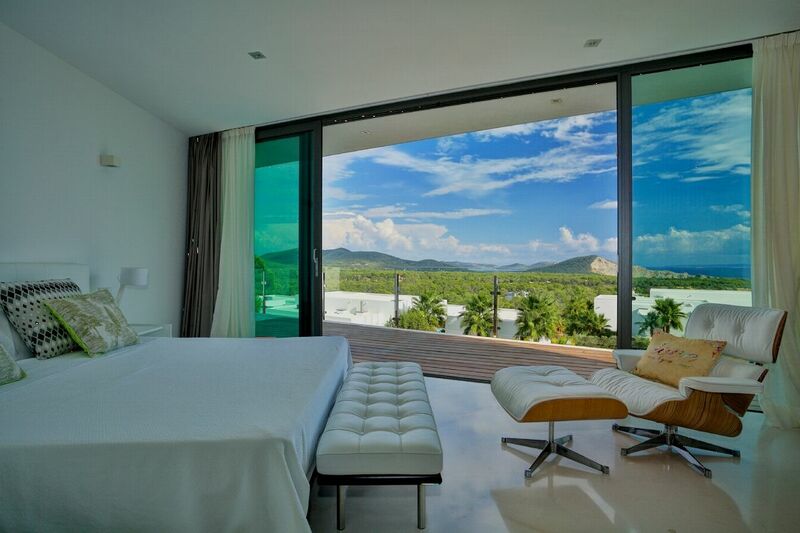 This bedroom takes up the whole top floor. 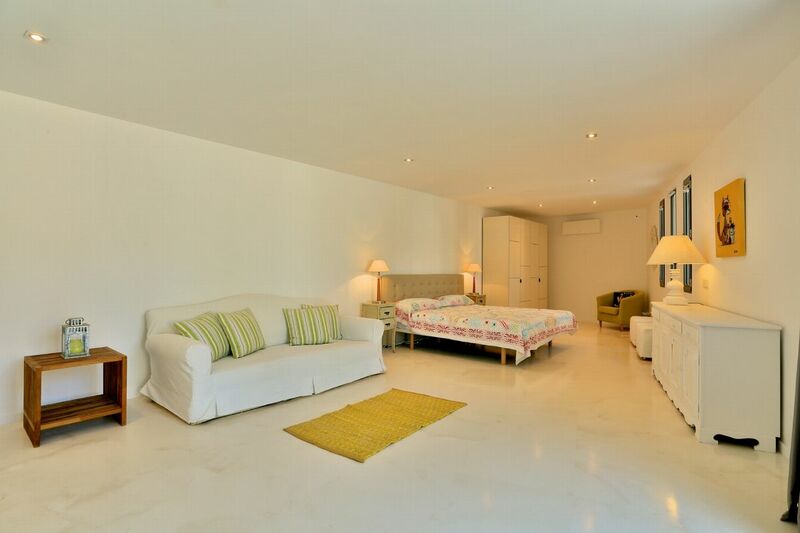 Large double bedroom with en-suite bathroom. 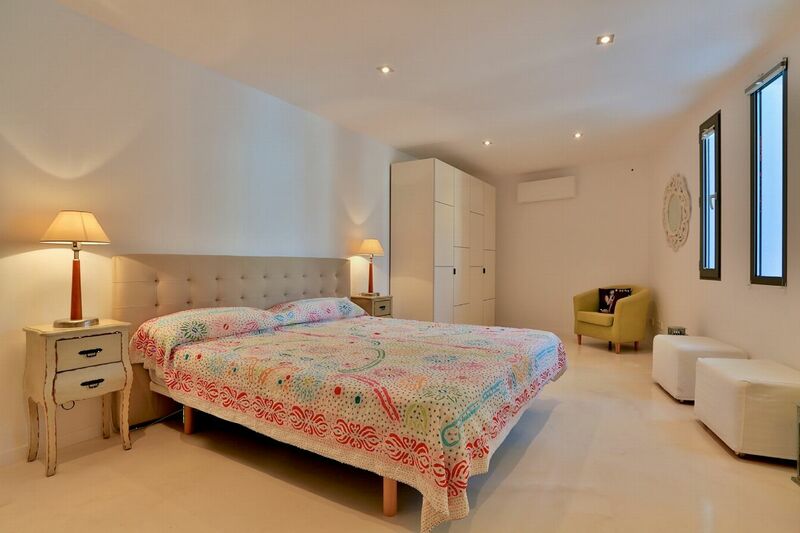 Large double bedroom with en-suite bathroom. 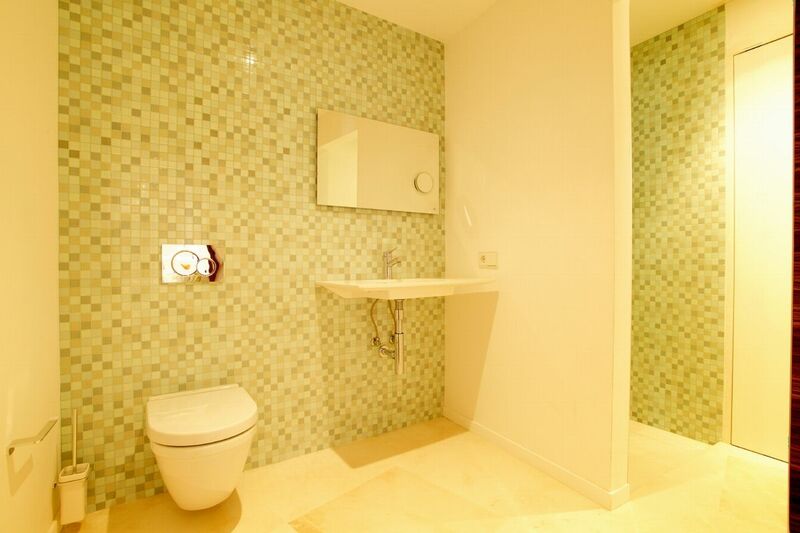 Located on the lower floor with direct external access.